Guardians of the Galaxy #13 was cover dated June 1991 and was on sale April 1991, sharing the spinner racks with Action Comics #666, Avengers #333, Captain Atom #53, Damage Control #1, Flash #51 and The Mighty Thor #433. 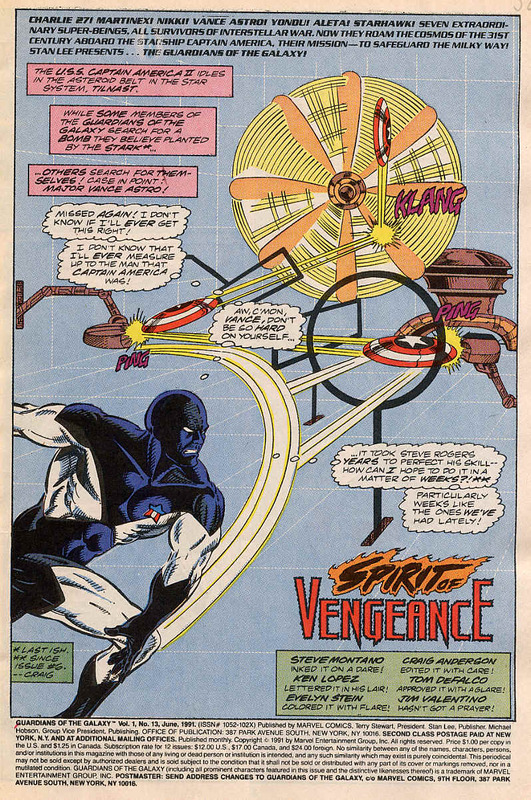 Spirit of Vengeance is written and drawn by Jim Valentino and inked by Steve Montano and opens with Vance Astro training himself with Captain America’s shield, whilst giving a bit of recap of recent events. First time I read this, I hadn’t yet read issues 4-11 and found this particularly helpful in that way that comics used to do very well, a bit of recap in case this was your first ever issue of the title. 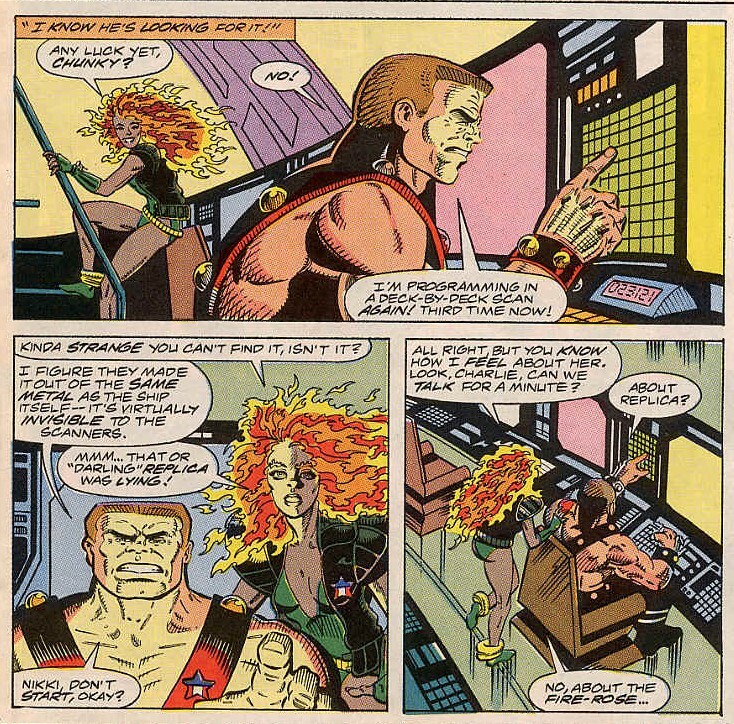 On the bridge, Charlie-27 is scanning the ship for a suspected bomb, left by the Stark in the previous issue while arguing with Nikki over the fire rose (also from last issue) they find that the bomb is in the gym, where Vance is. 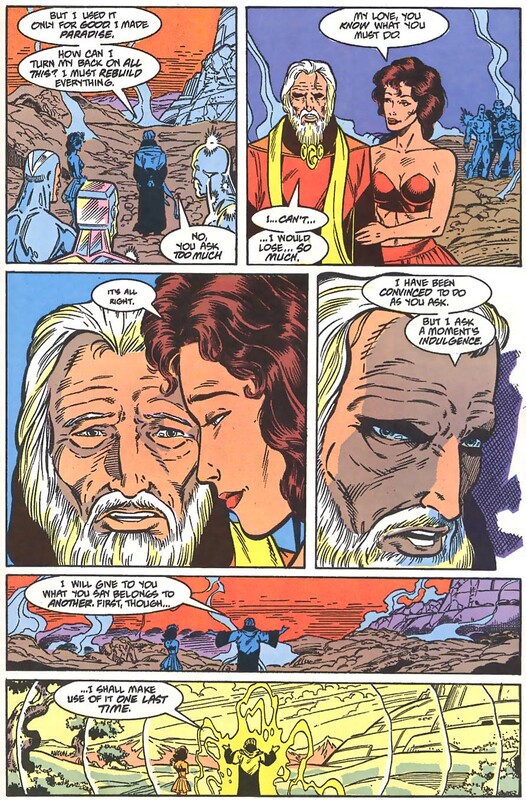 There is a scene running at the same time with Aleta trying to make peace with her ex-husband Starhawk. Who seems to give her relationship with Vance his blessing, while internally plotting to get his wife back. Aleta wanders in to see Vance in the gym and she asks to go back to his room and then the room explodes. On the nearby planet, Autolycus, the alien from last issue sees that there is a ship in orbit and his head turns into a burning alien skull and a fiery bike appears before him. He calls himself the Spirit of Vengeance, the Ghost Rider of Sarka. He launches himself into orbit to teach the blasphemers the true meaning of vengeance. There are also a couple of character scenes, where Replica puts forward her case to become one of the Guardians, which Martinex is wary of. There is also a scene with Yondu praying to his god Anthos, praying for guidance over his encounter with Photon. In the final cut away we see that an unseen figure, who is clearly Malevolence, recruiting Force by defeating them and negotiating with Brahl, who wants only one thing, revenge on the Guardians of the Galaxy. Back on the Captain America II, the team fear for Vance who has been saved by Aleta. Then the problem is repairs. 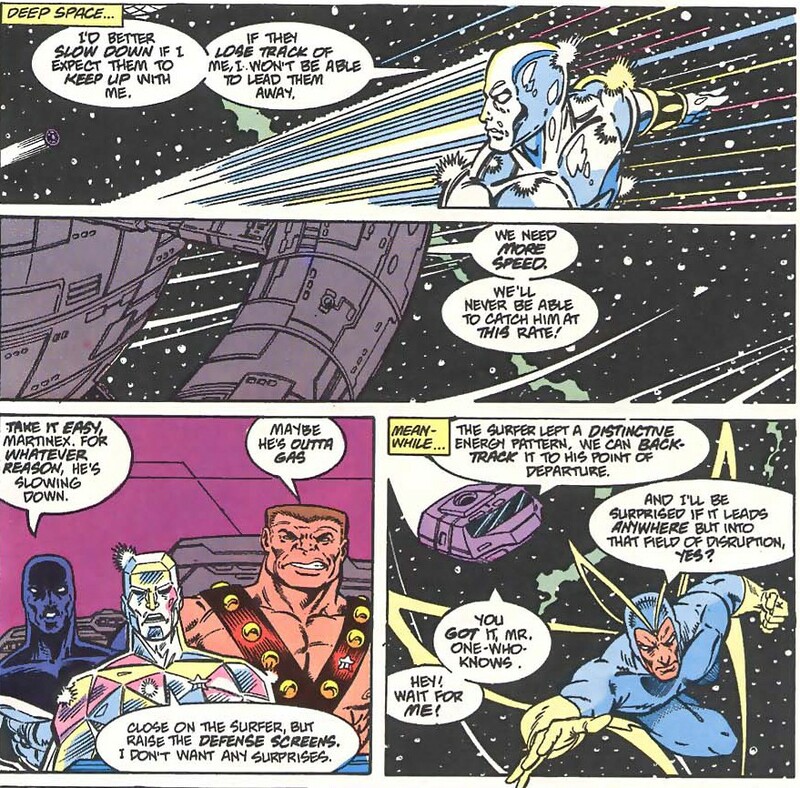 Martinex notes that there is planet nearby and they begin to get closer, when the Ghost Rider flies towards them. Starhawk. Starhawk seeks peace, but is attacked and burned by this Spirit of Vengeance. The fire burns him body and soul and severs him from his memores, he is no longer ‘One who Knows’. Charlie-27 fires on the Ghost Rider, despite Vance’s warning. It has little to no effect. Aleta flies outside to talk with him peacefully, while Nikki tries to contact Sarka to effect repairs. The Sarkan authorities ask if they are universalites and when Nikki asks they are unco-operative. They then contact the Guardians and offer repairs, if they kill the Ghost Rider. Aleta convinces the Rider to come aboard the ship and see that they are not universalites, but warriors against oppression. 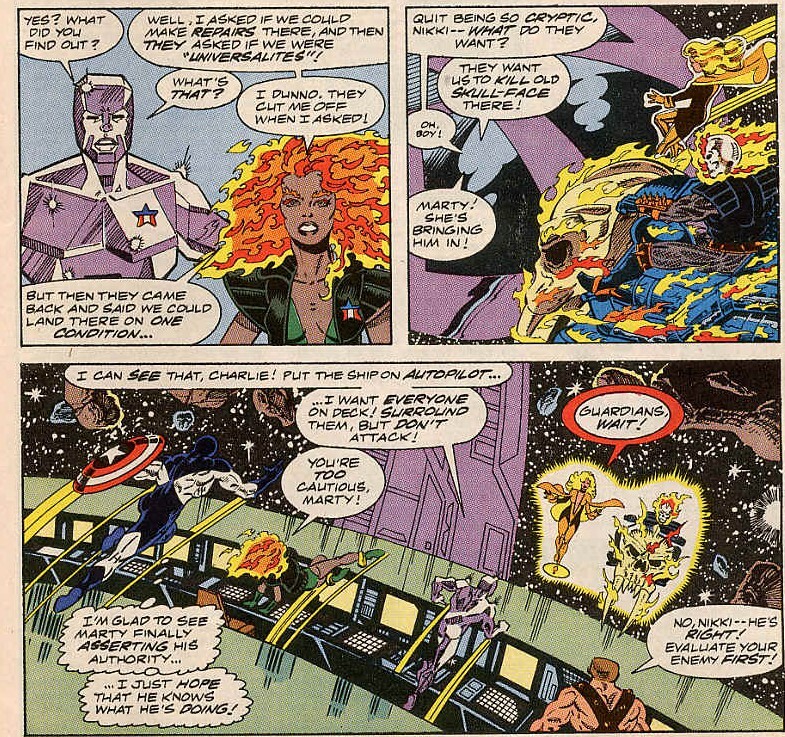 Sensing no deception, the Rider accompanies Aleta and appears on the bridge of the Captain America II. 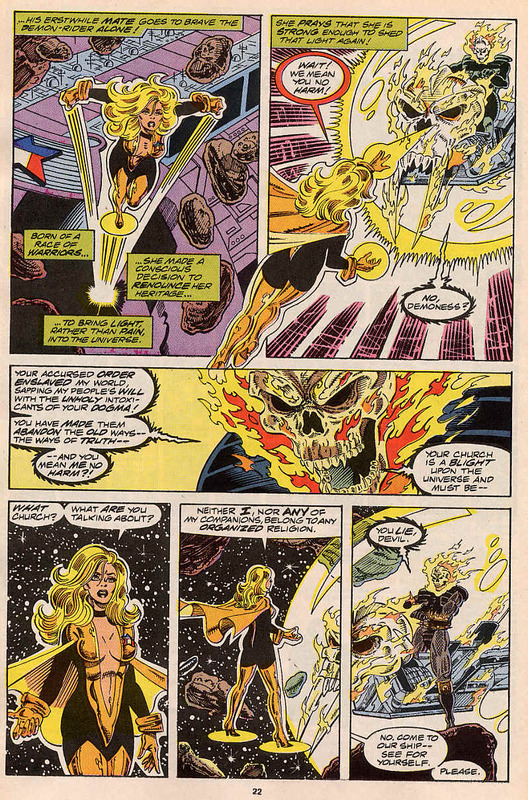 Things seem to have calmed down when Replica shows up and declares that the Ghost Rider is a demon and a slayer of priests, he must be killed. 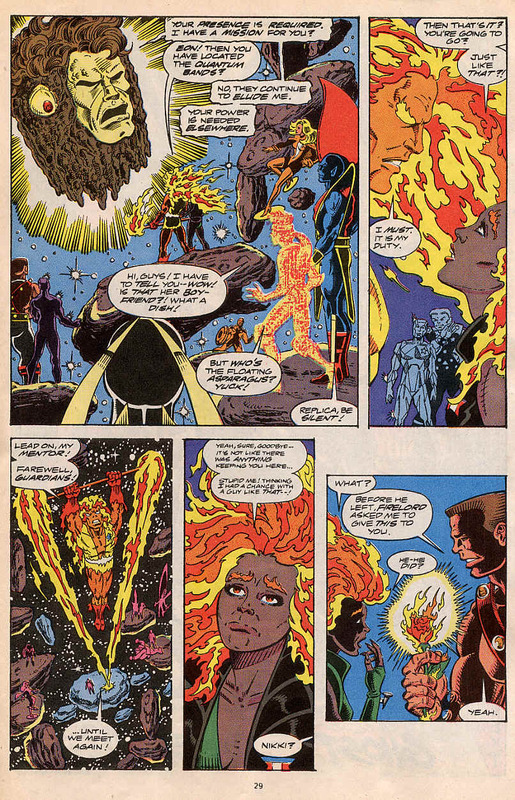 Seeing the Ankh-like symbol on her chest the Ghost Rider believes he has been lied to and declares that the Guardians will all die. Notes: A nice issue, setting up new stories, while clearing away some of the older ones. 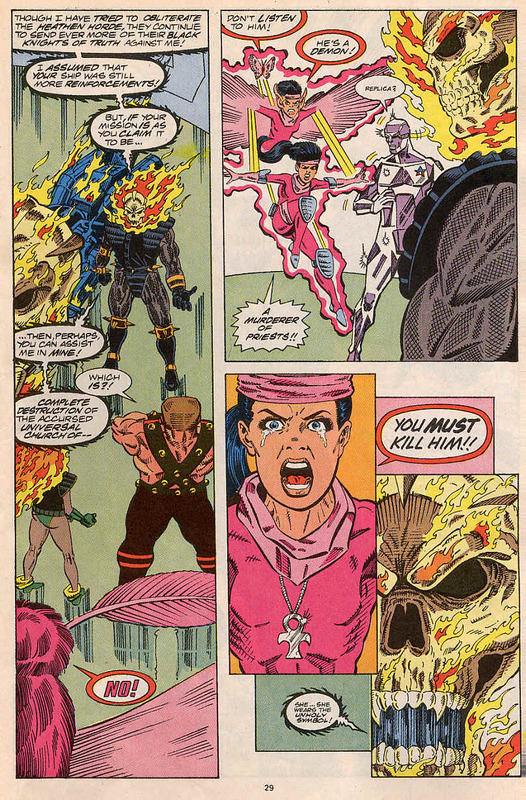 Vance, Aleta and Starhawk’s love triangle heats up, which adds character to the first half of the comic. 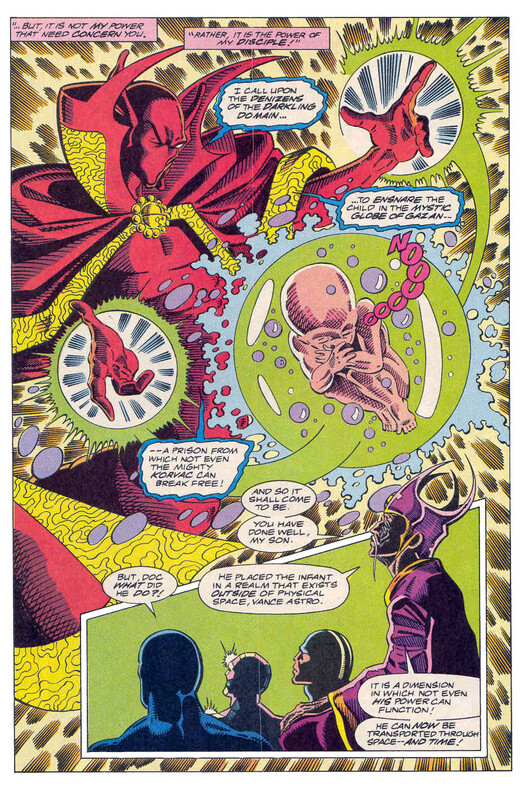 The Universal Church of Truth, the Magus and the Ankh symbol are all hold overs from Jim Starlin’s work on Warlock in the 70’s and are leading towards the title’s next major arc. Ghost Rider was inexplicably popular at this point in Marvel and so this character isn’t so much of a surprise really, just like Rancor in the world of mutants story. The Guardians are always going to be linked to the present day Marvel Universe and this is just another element of that. Vance using Captain America’s shield has forced him to move beyond his self pity and stand up as a hero in his own right and not just some survivor of a bygone age. All of the threads of the last dozen issues are starting to weave together and I’m remembering why I loved this title so much when it first came out. Next Time: Destroyed by the Spirit of Vengeance. 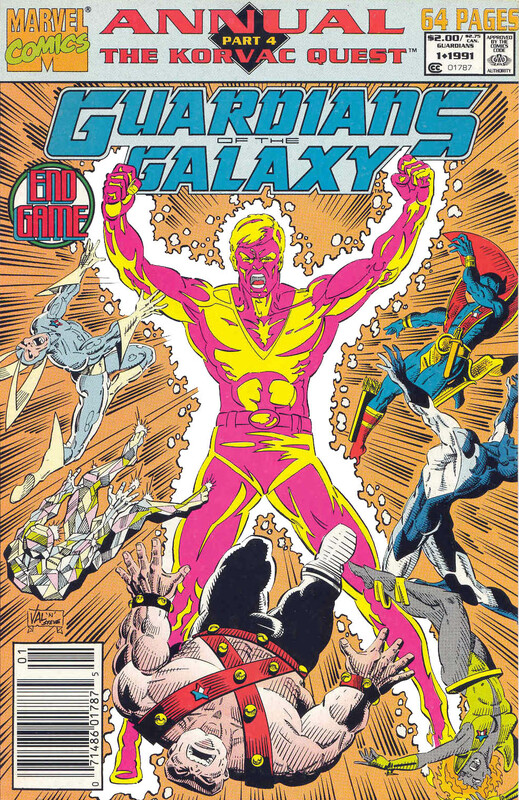 Guardians of the Galaxy Annual 1 was on sale May 1991, sharing the spinner racks with Animal Man #37, Iron Man #270, Legion of Superheroes #20, Quasar #24, Superman: Man of Steel #1 and Uncanny X-Men #278. There are three stories in this issue. 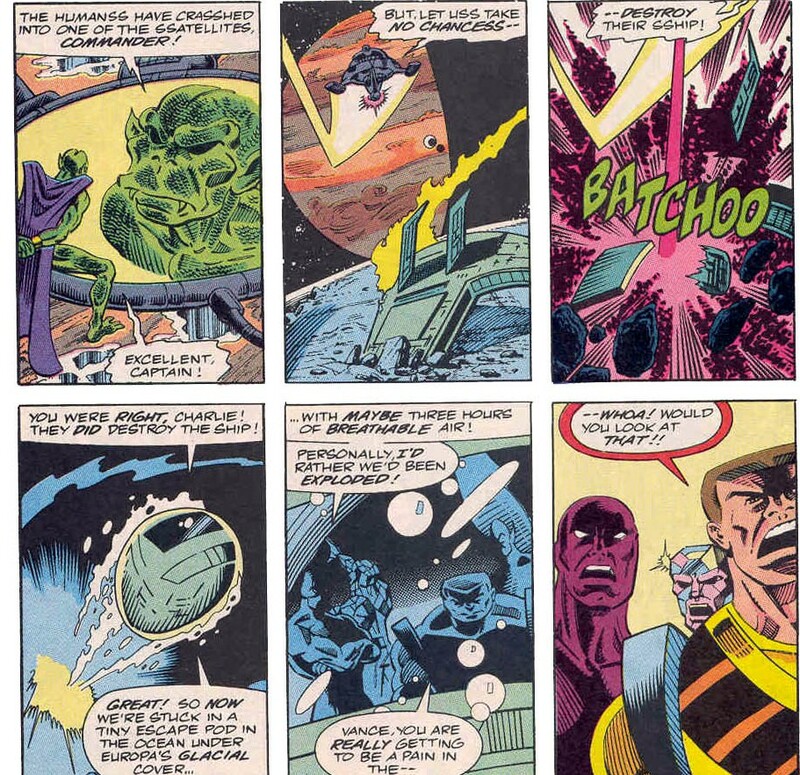 The origin of the Guardians, which we’ve already covered so I won’t waste everyone’s time with, part 4 of the Korvac Quest and a tale of the early days of the Guardians all done by Jim Valentino. 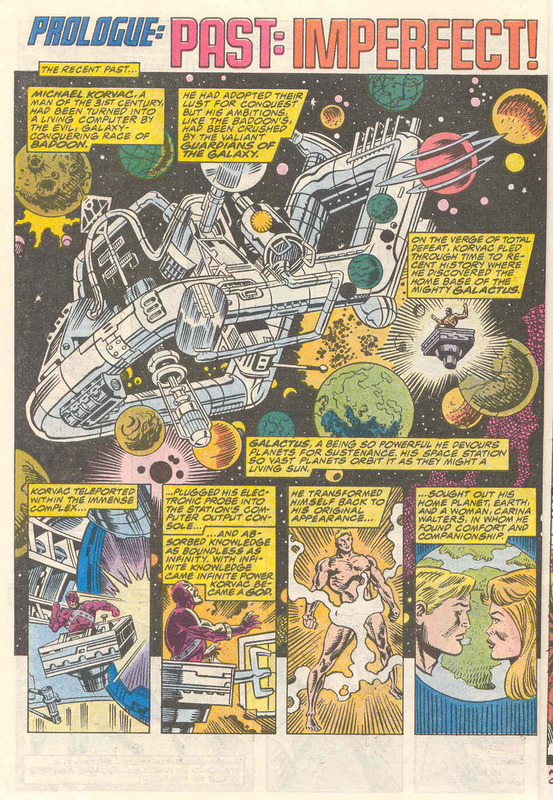 The final part of the Korvac Quests opens with the Guardians of the Galaxy, aboard the Drydock, arriving at the tail end of the 30th Century in orbit of Earth’s moon. On the moon’s surface in the Lunar colony, Michael Korvac’s father awaits the birth of his son and senses the Guardian’s presence. He lends part of his power to protect his wife as he goes through labour and flies into the sky to attack the Guardians, whom he believes are here to kill his family. There is a fierce battle, with the Guardians holding their own against Korvac Snr. After stopping by the Watcher’s house and being observed by the moon’s leaders, the team face Korvac Snr as his son is being born. He tells the Guardians that he would gladly give his life to his son. A statement his son takes quick advantage of, draining the power off his father and becoming Michael: The Enemy decades earlier than he should. The Guardians face off against the infant Korvac, fully knowing that they stand almost no chance against him. Fortunately, the team’s resident pre-cog has already seen this coming and summoned an ally, Krugarr the Sorcerer Supreme. Krugarr appears alongside his teacher, the ancient one. 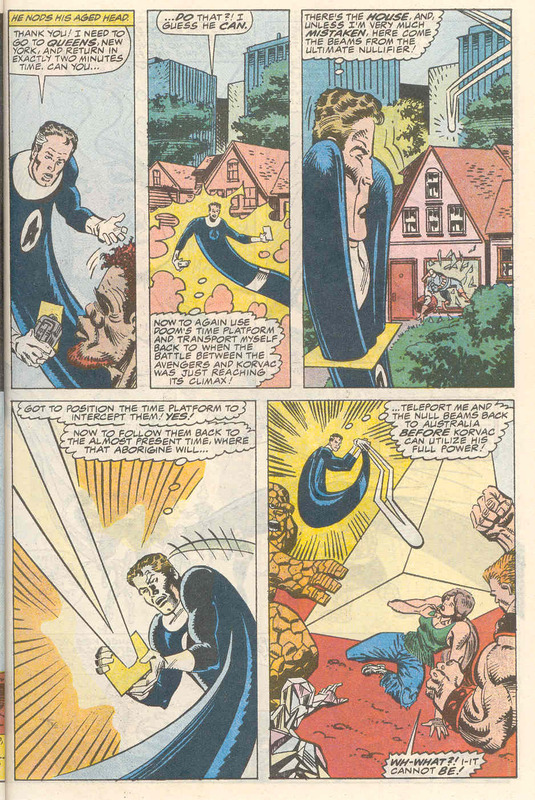 Vance Astro recognises him immediately as Doctor Steven Strange, the Sorcerer Supreme when Vance was a child. Contained in this magic bubble, the baby Korvac is taken back through time to the point where all this started, the end of the original Korvac Saga. 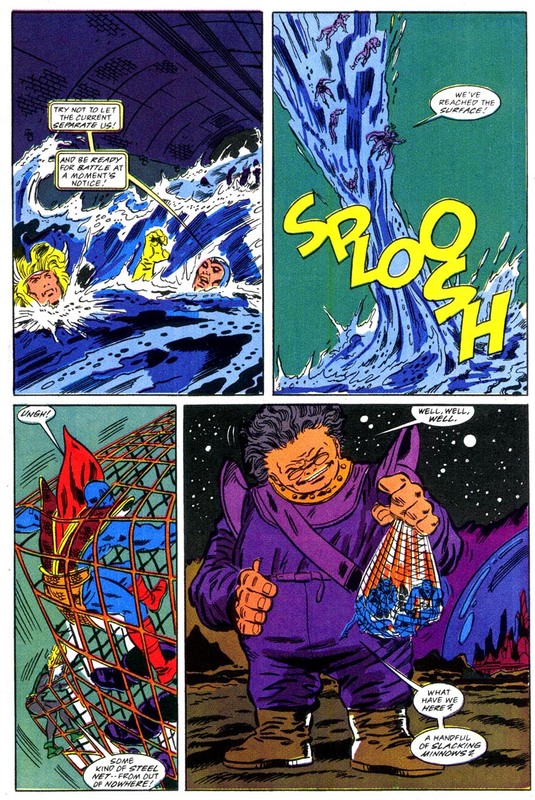 They appear on the world ship of Galactus who drains the infant of all the stolen power, but leaves the child unharmed. Now the Guardians are left again with that debate. What do they do with this baby that they know will become a monster. 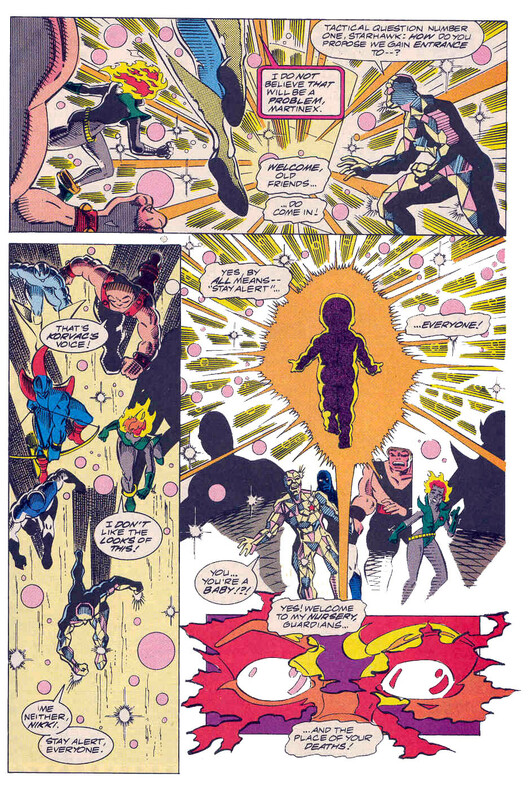 Being the good guys they are, they return the baby to his mother, who they tells the baby to wreak vengeance upon the Guardians after they leave. 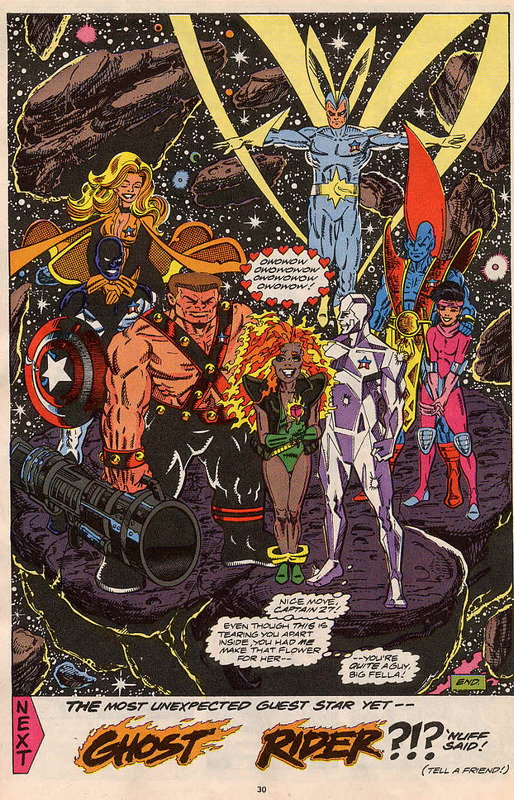 The Guardians were always destined to create Korvac. 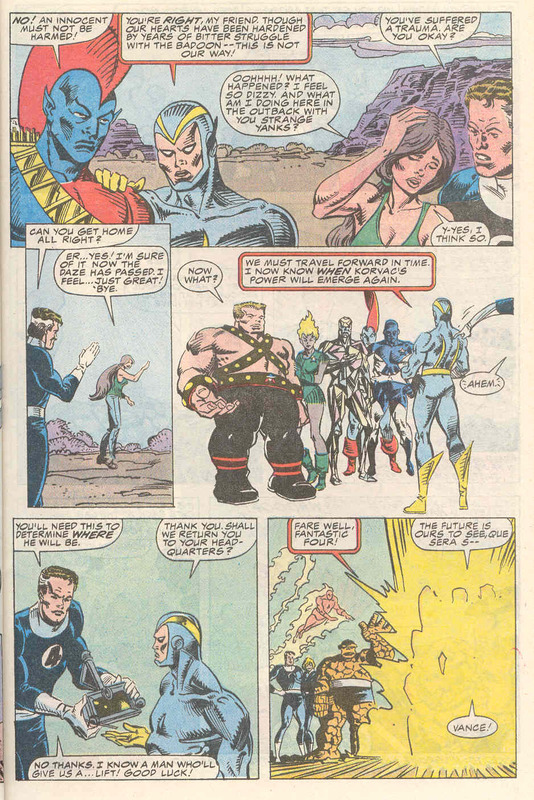 The team then make Aleta an official member of the team and Yondu finds the book of Antag, starting off the Guardians’ quest to find the shield of Captain America. This leads directly into Guardians of the Galaxy Vol 1 issue 1. 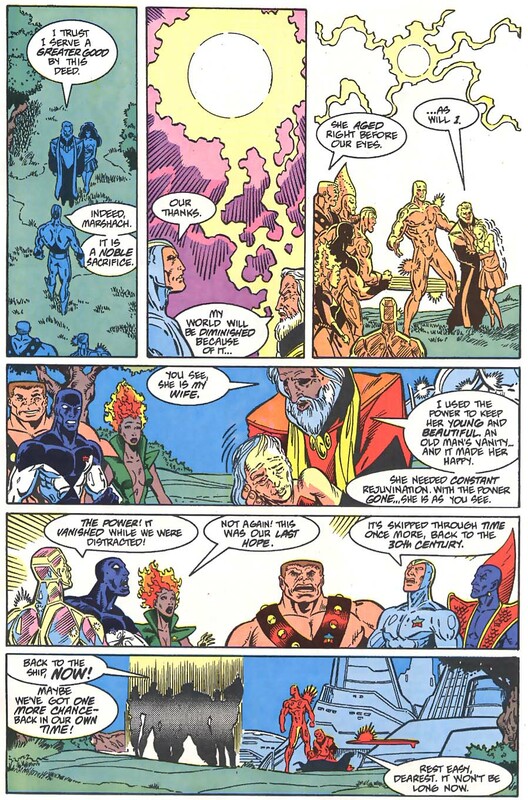 The next story takes place shortly after the Guardians meet up for the first time and the team only consists of Vance Astro, Yondu, Charlie-27 and Martinex. 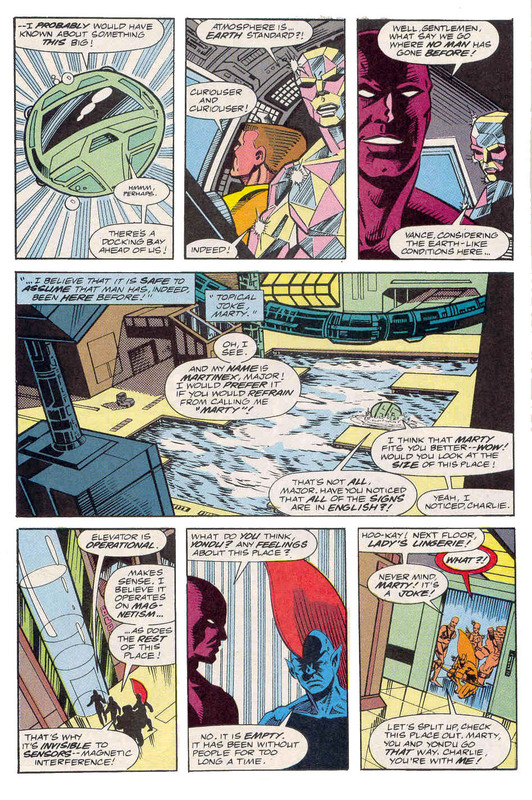 They are holed up in some abandoned building, in the ruins of New York City (I’m only assuming that, NYC is always Marvel’s go to location) There is some silver age bickering until Martinex comes up with the idea of finding a new location and means of transport. The team wander through the streets until they find the matter transporter. They remove the guards, punch in co-ordinates and are teleported to Jupiter. They soon are surrounded by Badoon and realise that whenever they use the matter transporter, the Badoon can work out where they will materialise and can be ready for them. The team then steal a shuttle and after some fancy flying and dog-fighting, they leave Jupiter and crash land on the ice/ocean moon of Europa. The shuttle is destroyed with an escape pod fleeing unseen and finding a huge metallic structure under the surface of Europa. Nothing should be here, not even any government facilities. The team fly inside the structure to look around. The whole place runs on magnetism and with the huge M on the front, it does lend itself to you working out who built the place. The team go on board and find all sorts of things, from food, to costume-making facilities and then a large two nascelled spaceship, almost completed in a drydock. 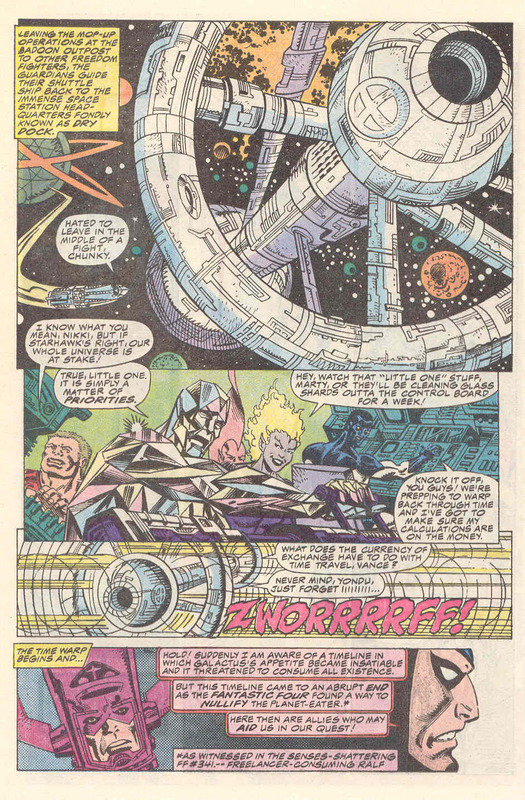 The team decide to stay, to load up on provisions, clothes and tools to repair the ship and then they leave, piloting the USS Captain America out of Europa’s orbit and into their battle against the Badoon. Finally, with part 4 everyone looks consistent, with costumes and art matching the more familiar Guardians look. The story has a nice conclusion, with time sorting itself out and the power of Galactus being returned to Galactus with the baby surviving. 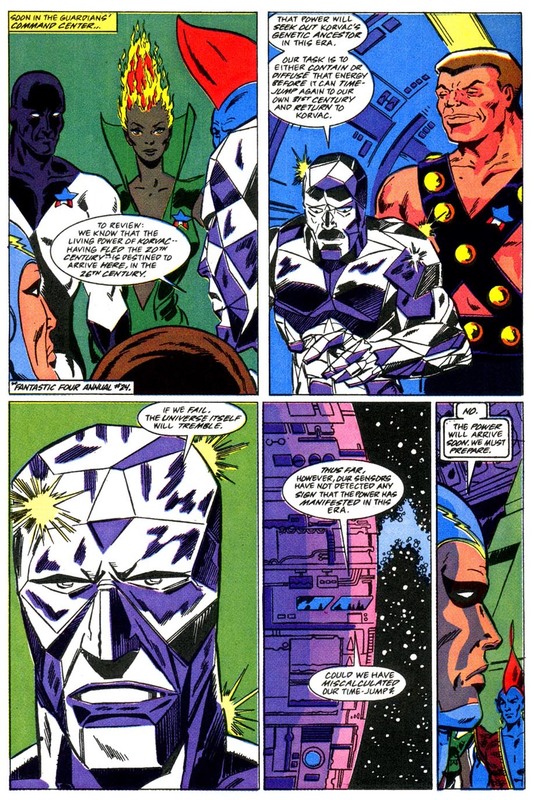 At this point in the 30th Century, the inhumans are in a reservation on the moon, which has interesting (if heavy-handed) parallels to Native Americans in the past. 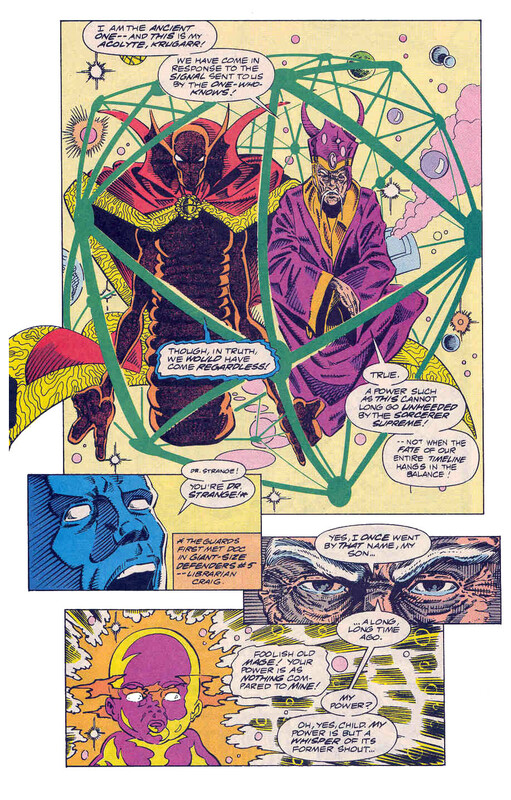 In the Watcher’s house, the Guardians see alternate versions of their reality before being shown the door by Uatu, the Watcher. An irrelevant bit, but a nice addition to this issue. The Guardians become the inspiration for their own worst enemy, a bit trite, but you need to have something like that with time travel stories. An up and down story with a nice finish. This is a nice little story, filling the gaps between Marvel Superheroes #18 and Marvel Team Up #5, this shows both where the Mutants of Haven started from and where the USS Captain America came from as well, tying them up in a well written story. I like how none of Vance’s jokes are got by anyone else, a nice little Buck Rogers-ish moment and fleshes out Vance’s man out of time sort of thing. Over all a great little annual, full of bits and pieces that are worth looking at for even a passing Guardians of the Galaxy fan. 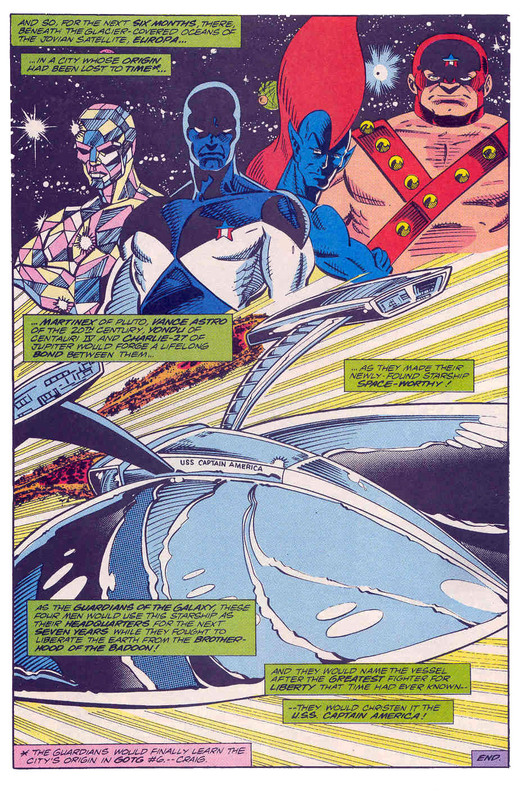 Next Time: On an all new post, we return to the Guardians’ main series. Price of Paradise was written and drawn by the two Rons, Marz & Lim and opens with Silver Surfer flying towards a planet, soon revealed to be Zenn-La. 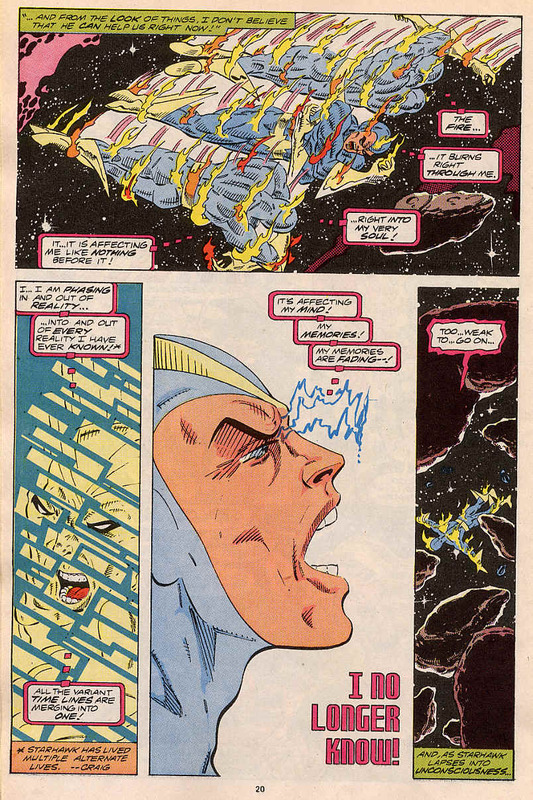 He meets up with Shalla Ball, the love of his life when he was Norrin Radd. They have a tender moment, she pulls his silver skin-sheath off, revealing his original appearance. They kiss and then she ages do death in seconds. 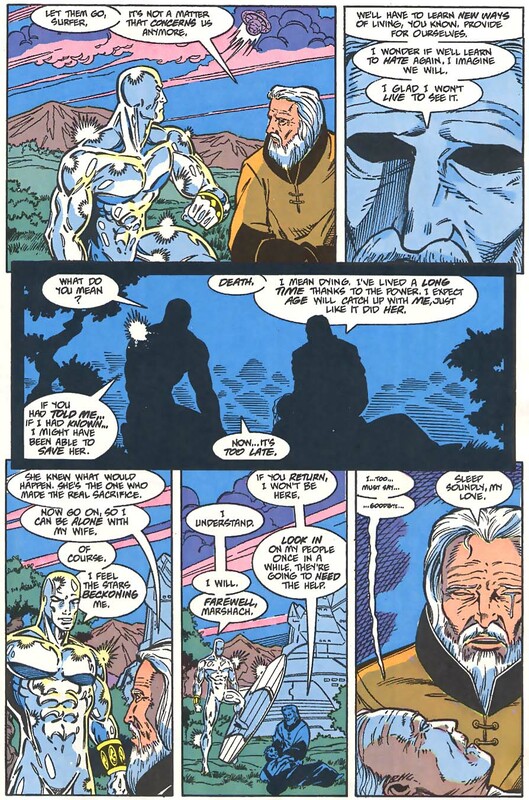 It’s revealed to be a dream, it is in fact now 5 or 6 centuries later, Silver Surfer is on another world talking to a being called Marshach. He is taking rest on Marshach’s world and you can see he’s wearing Quasar’s quantum bands. Marshach tells the Surfer than although no outsiders are welcome apart from him, there are strangers looking for this world and he fears what will happen. The Surfer promises to lead whoever this is away and flies off. Marsharch watches him leave and then beings to reflect on his origin. 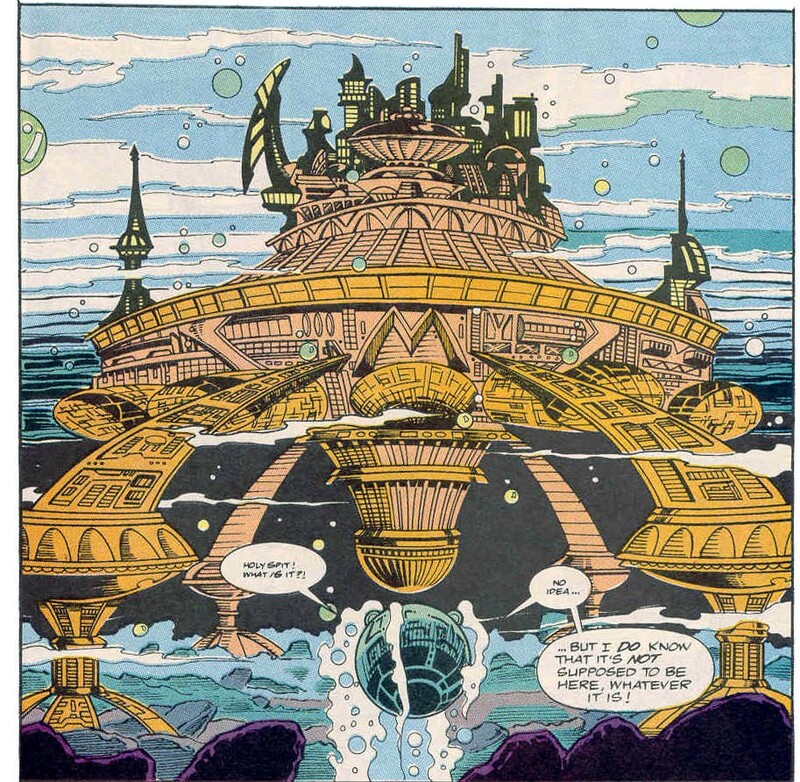 It transpires that at some point, this world was a colony from Earth and after some harsh years, Marshach received the power of Korvac and used it to make this colony a paradise. The people made him their leader and for a long time afterwards, he did what he could to benefit their lives and now he sees this time coming to an end. He share his fear and trepidation with his wife Kareela. 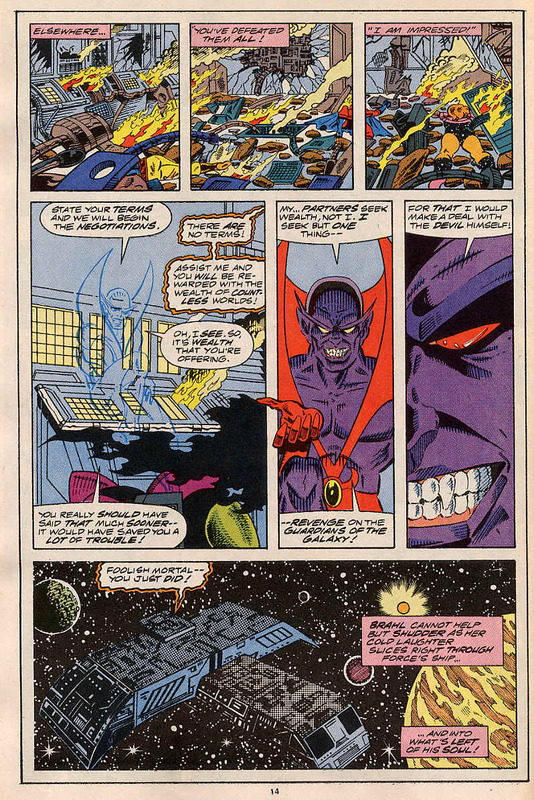 At this point, the Guardians of the Galaxy arrive in this time in Drydock and begin to search for the power of Korvac. 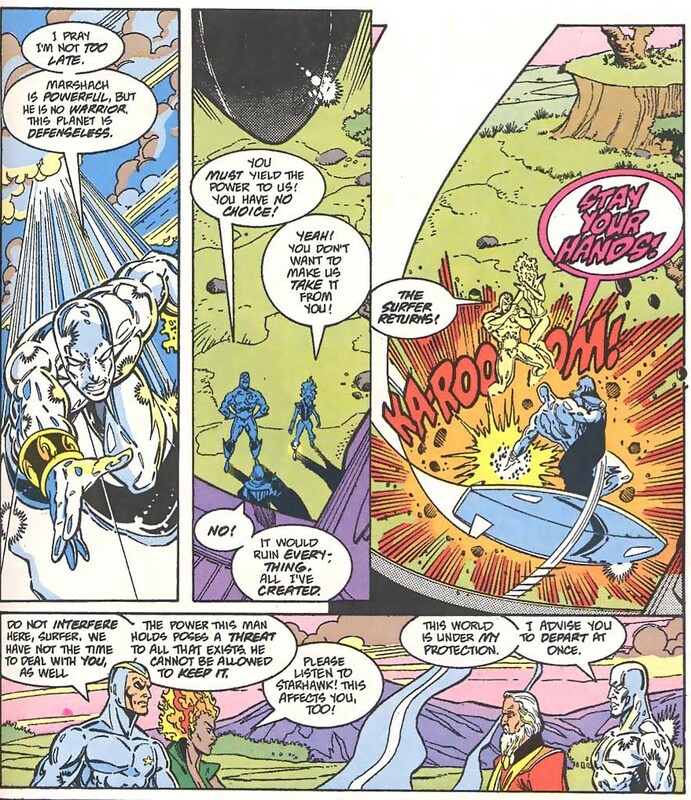 Silver Surfer appears out of nowhere and races away from Marshach’s world. The Guardians, less Nikki and Starhawk follow. 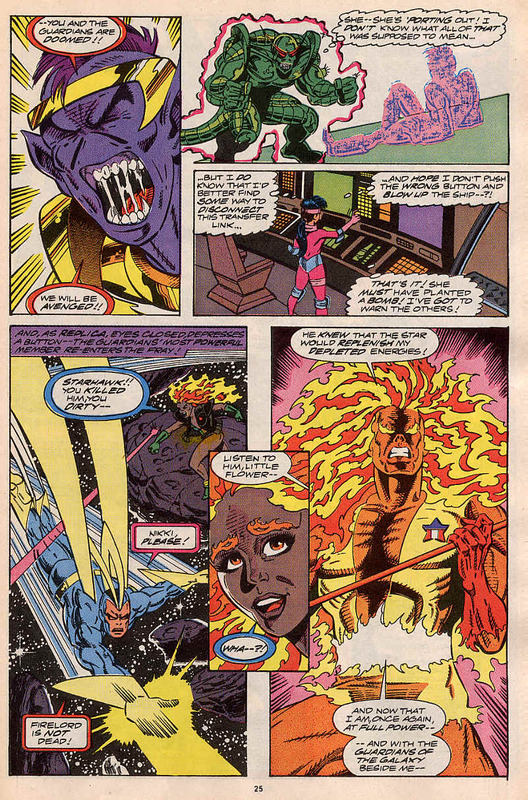 Nikki and Starhawk arrive on the planet and Marshach summons the Surfer back to defend him and the Guardians follow Surfer back and everyone ends up on Marshach’s world. 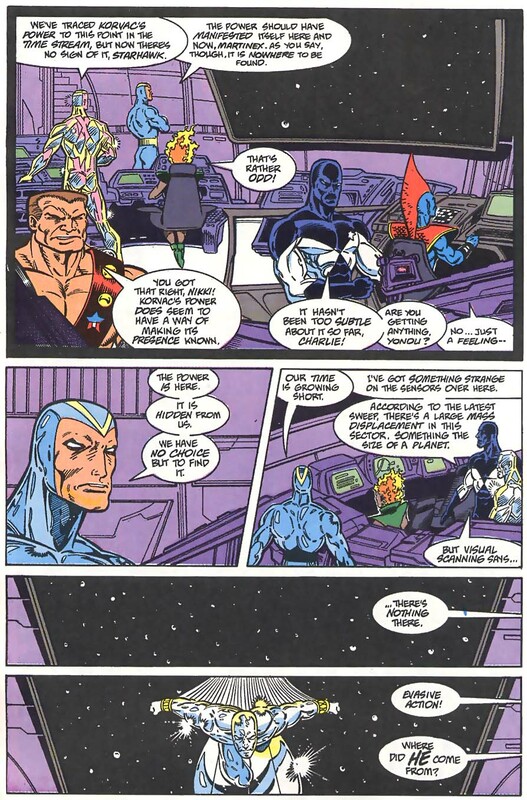 Nikk and Starhawk try to convince Marshach to voluntarily relinquish the power of Korvac and when he refuses, they threaten to just take it. That’s when the Surfer returns, shortly after that the Guardians return and the battle truly begins. The fight against the Surfer is brief, but spectacular. 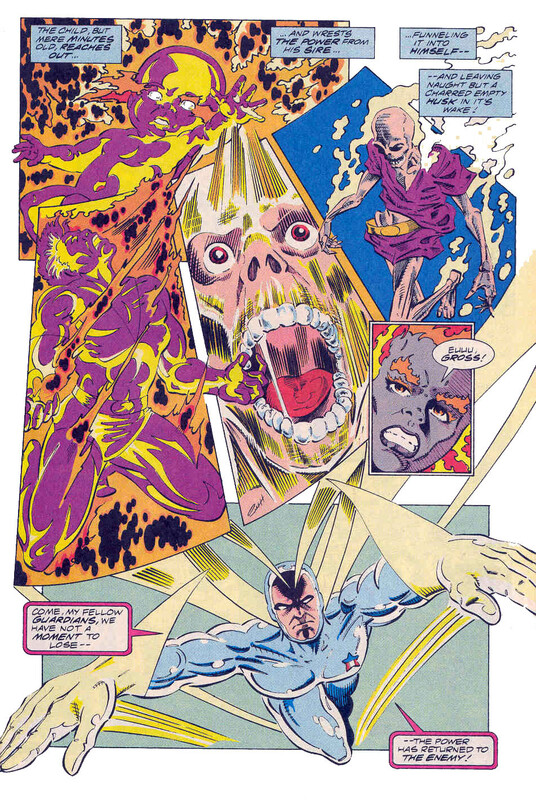 The Guardians cannot hold back due to the awesome power of the Silver Surfer. Some civilians are caught in the battle and killed and Marshach realises high cost of this battle. Kareela convinces Marshach to surrender the power and allow the Guardians to take it. 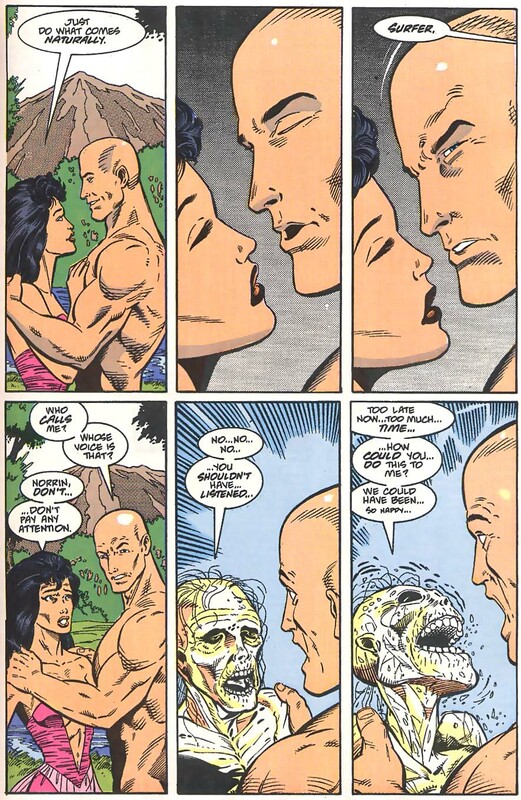 The power gone, both Kareela and Marshach die, Marshach waiting long enough to ask the Surfer to keep an eye on his world and telling him that he fears for the future and is glad he won’t see it. 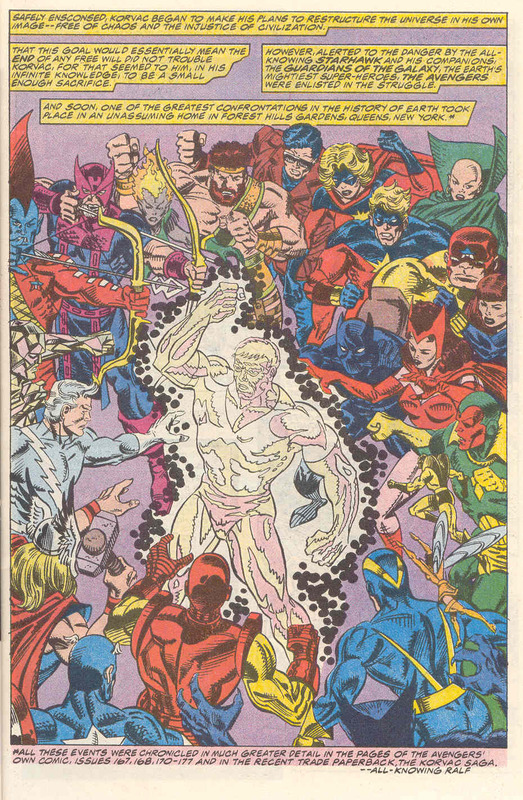 This halts the Guardians enough for the power of Korvac to flee to the 30th Century and the birth of Michael Korvac. While not a spectacular comic, it’s an improvement on the previous two. 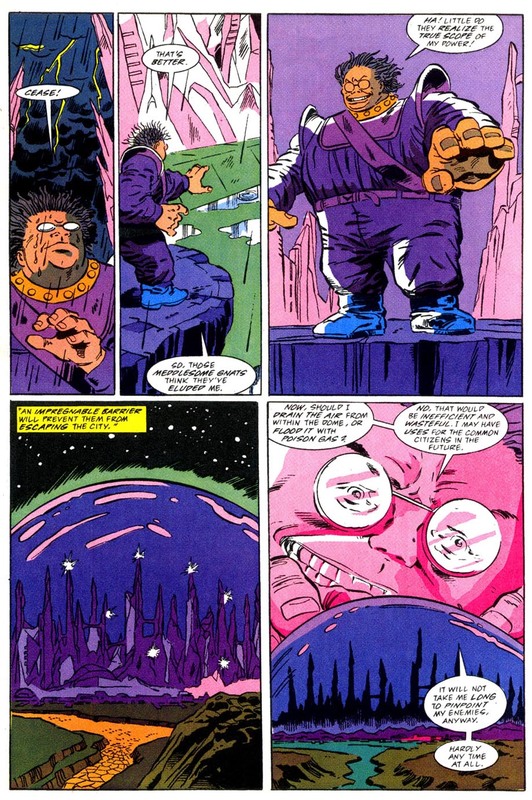 Although it’s the Guardians’ arc and the Surfer’s annual, this very clearly Marshach’s story as he is clearly the hero. He feels that the intruders will take damage this paradise and that’s very true and he fears not for himself, but for his people and the future they’ll live in. Notes: This is the strongest so far in both story and art. 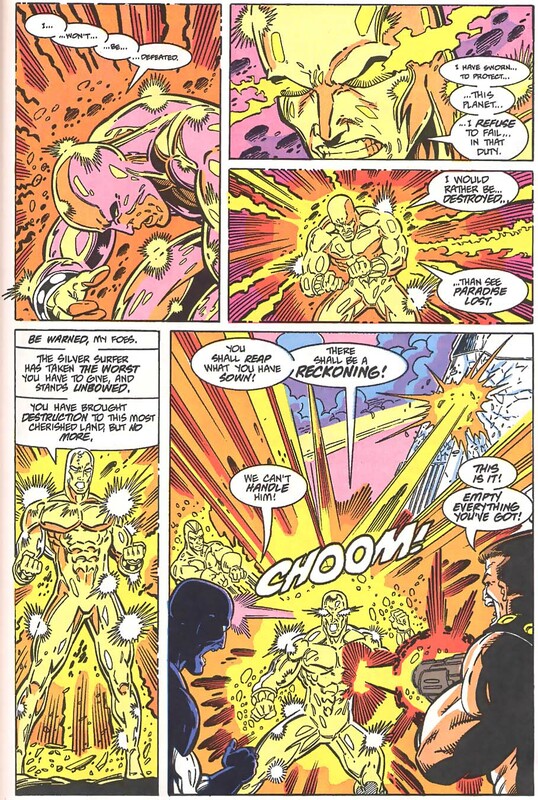 Ron Lim has had a long history with Silver Surfer and is perfectly suited and the energy packed battle is well rendered. The other Ron, Ron Marz doesn’t have much of a story to work with, but he does well with it. In a handful of pages he fleshes out Marshach and Kareela and when it’s over, you do feel for them. Their sacrifice is heartfelt and full of awareness making these two the heroes of this tale. 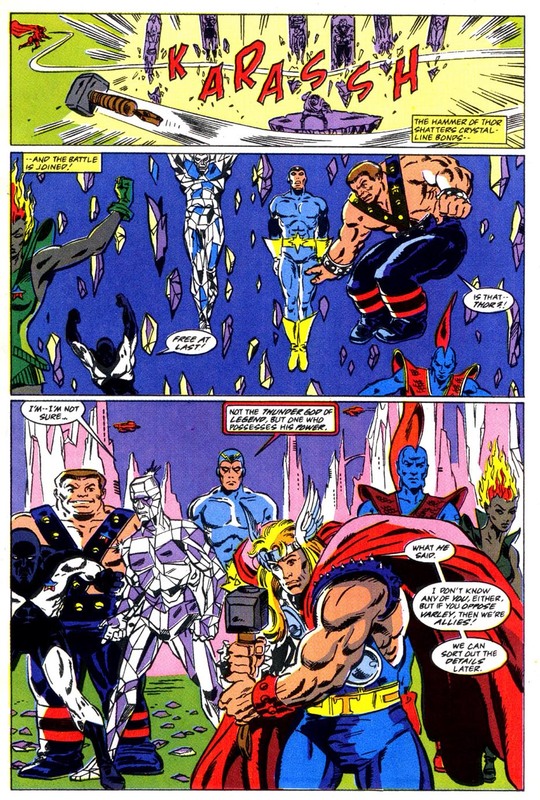 Their sacrifice is also pointless, the Guardians miss the power of Korvac and have to go on again. Outside of their own title, the Guardians lack any kind of depth and are just cyphers for the story, but at least it ends in their own, which makes me a little more optimistic. Hello again all and sundry. Once again am taking a little break from my ongoing Guardians coverage to do a special one. Two points to go through today. 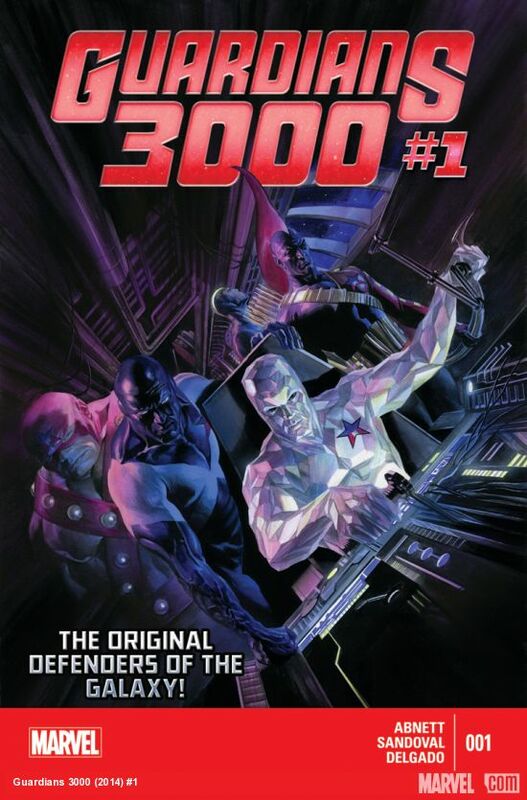 Guardians 3000 was released this month. Written by Abnett & Lanning, who re-wrote the book on how to do Marvel Cosmic and drawn by Gerardo Sandoval, it’s a promising issue one and anyone reading this blog could do worse than checking it out. Earlier this year, I did an post on podcasts. This was seemingly well received and I realised that there’s at least half a dozen podcasts that were not listed, mostly because I hadn’t heard them yet. Some of these are new, some are less so, but I’ve enjoyed each of these recently. We have the inevitable return of the Godfather of comic related podcasting, Mr Michael Bailey. From Crisis to Crisis as the name suggests is a look at the 20 or so year period between Man of Steel #1 in 1986 to Adventures of Superman #469 in 2006. 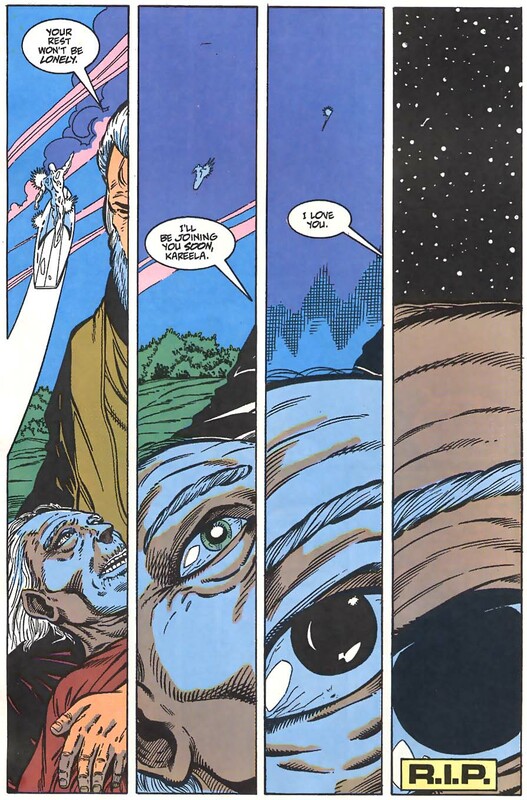 That sweet spot between Crisis on Infinite Earths and Infinite Crisis, where I myself first started reading Superman. 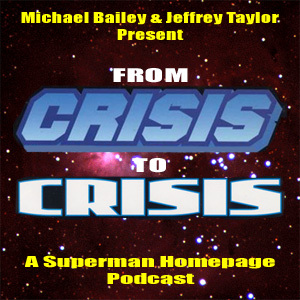 I am so very far behind on this podcast, but am really enjoying the synopsis and commentary from Mr Bailey and his Co-host Jeffrey Taylor. It’s one for the long-haul, but it is definitely worth a look if you’re a fan of the Man of Tomorrow. This is the brainchild of Gene Hendricks, who along with others including Dr Bill Henderson, takes an irreverent look at comics and TV. Some episodes are Legends of the Super Heroes, which is a fond look at comic related TV and Film. The Batman episode was particularly good. 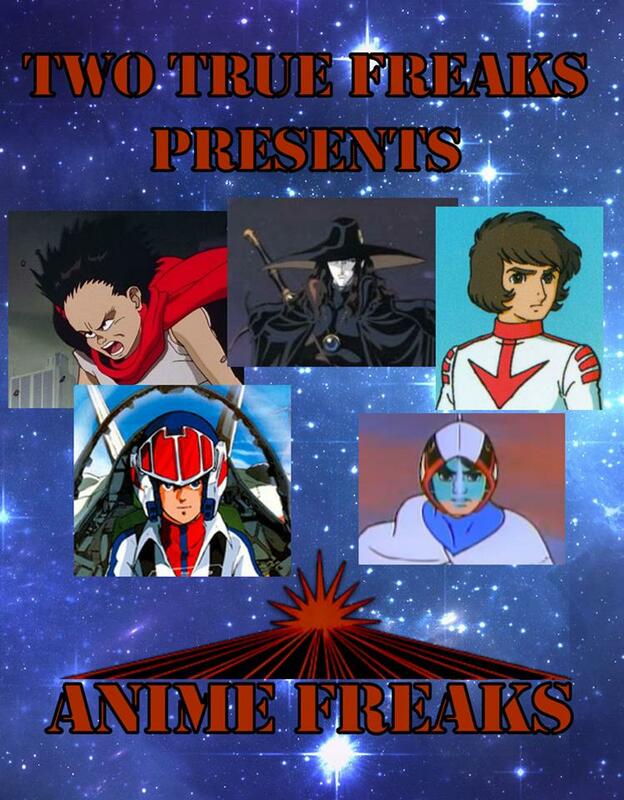 Another Two True Freaks podcast and another Gene Hendricks and Dr Bill Robinson podcast. This one dealing with anime shows, so far they’ve look only at Starblazers, the American translation of Space Battleship Yamoto. They talk intelligently and fondly, but there’s lots of comical picking at it as well. 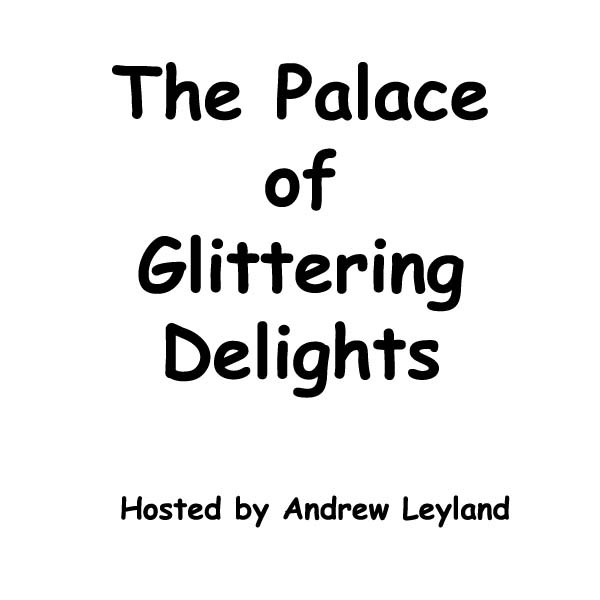 Palace is a spin off show from Hey Kids Comics in which Andrew Leyland takes centre stage to discuss television of yesteryear. 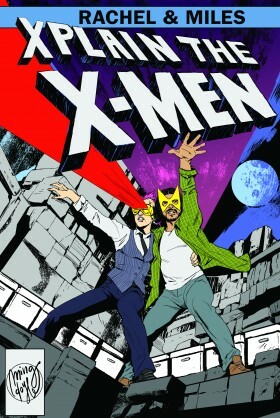 Again its full of the usual insight and humorous commentary and is a great companion show to Hey Kids Comics. Andrew Leyland takes us to. 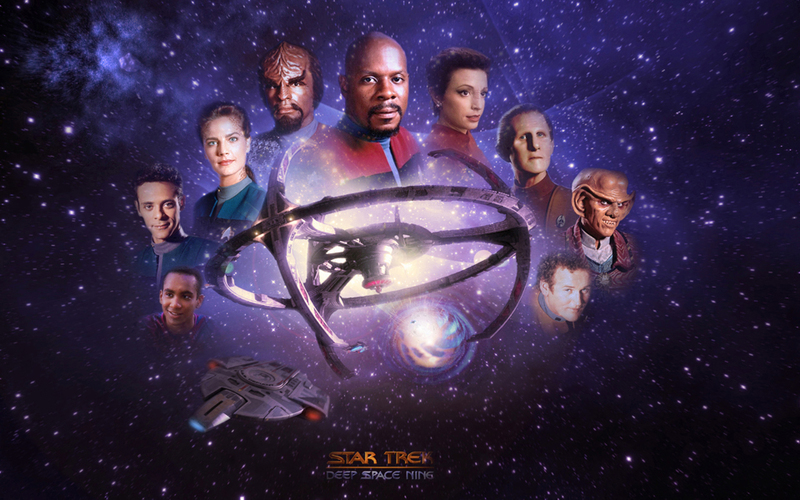 Listen to the prophets is an episode by episode retrospective of Star Trek: Deep Space 9. Often seen as the lesser member of the Trek family, I have long been of the opinion that it was the better show overall. If you are also of the opinion that DS9 was under-rated, then this is the podcast to you. Andrew Leyland, Paul Spattaro and Shaun Engle walk you through each episode and reveal both the good and bad. Shaun Engle takes us to. 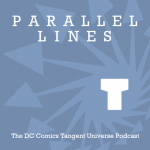 Parallel Lines: A Tangent Comics Podcast. 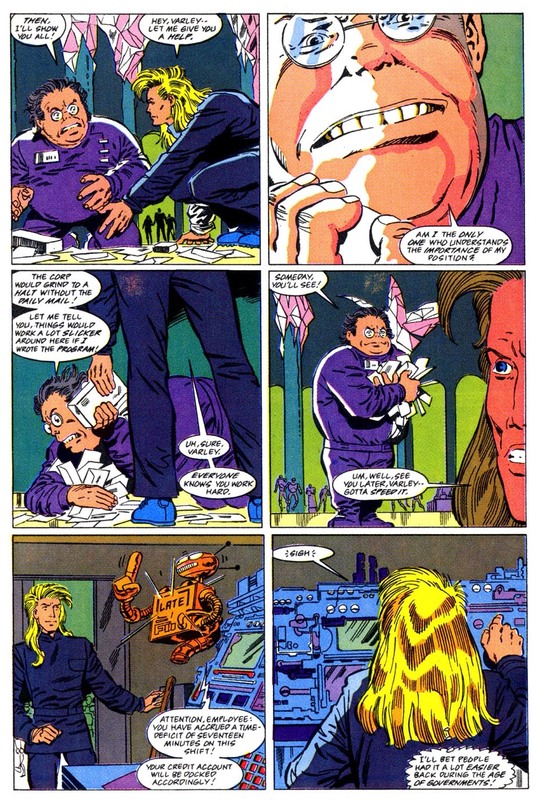 Parallel Lines is the work of Michael Bradley and Shaun Engle who look at the brief run of Tangent Comics published by DC Comics in 1997 and 1998. 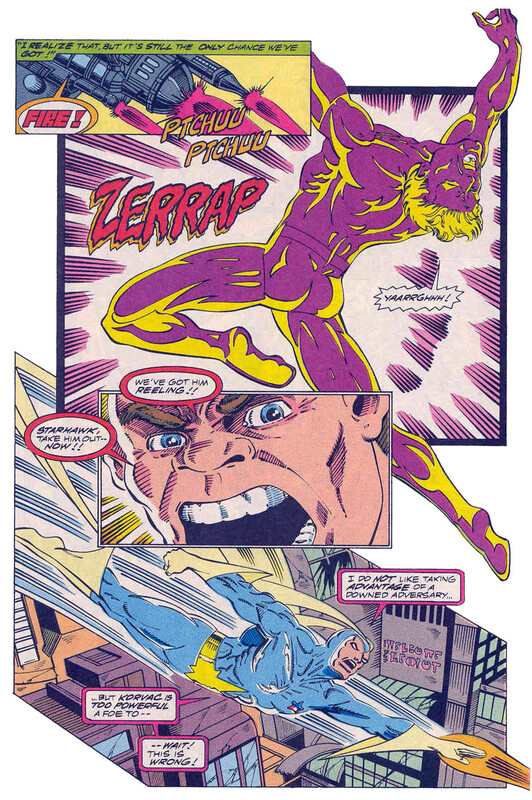 Here names were used from the mainstream DC Universe, but in different contexts for radically different stories and ideas. The Flash isn’t a guy in a red suit, it’s a teenage girl made of light. Green Lantern isn’t a space cop, she’s the host of a house of mystery style anthology comic about a person’s return from the grave for more thing to do before rest and so on. It’s a variation on what happened at the start of the silver age, where the name was used, but little else. The comics are interesting and all fit within this Tangent universe and Mike and Shaun are good guides to this new and different spin on DC comics. Crisis on Infinite Mid-lives is a husband and wife podcast, which is just two people (often a bit merry) talking about comics and comic related topics. Sometimes it’s insightful, occasionally a bit crude, but mostly it’s hilarious, sometimes it’s just the episode titles. Because it’s about time somebody did. This is my favourite podcast discovery of the year for three reasons. 1: I have been and always shall be a massive X-Men fan. 2: It’s f***ing hilarious, just the opening section alone. 3: I listen to this with my awesome wife. While me and my lady enjoy the same TV most of the time and most of the same films, her interest in comics is peripheral at best and her interest in comics fandom/podcasts are pretty much none existent. I got her to try it and we’ve been listening to it together since. It’s a great podcast for the long time died in the wool types like me, but also is fairly accessible to someone without that background. It points out the good and bad of X-Men and let’s be honest here boys and girls, there’s a hell of a lot of both. 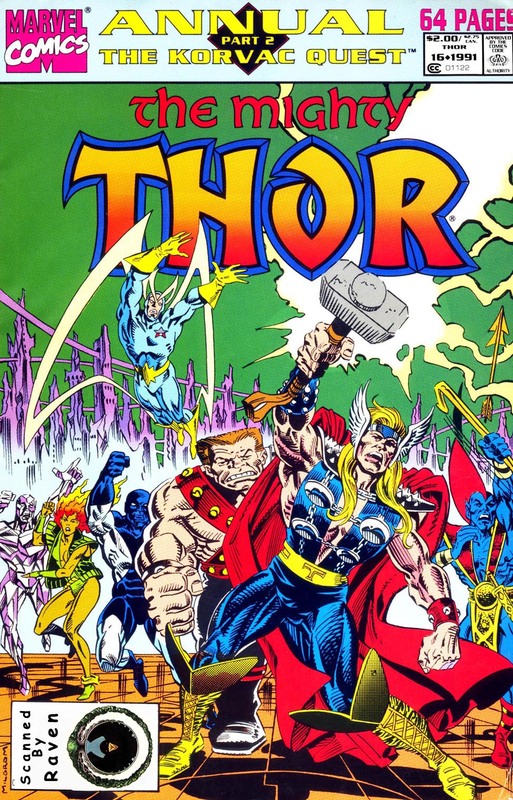 Thor Annual 16 was on sale April 1991, sharing the spinner racks with Action Comics #666, Alpha Flight #97, Flash #51, Mighty Thor #433, New Titans #76 and Sleepwalker #1. The Future dies now: Korvac Quest Part 2 was plotted by Tom DeFalco, scripted by Len Kaminski, Layouts were by Alex Trimpe and pencils were by Herb Trimpe with Fred Fredericks on inks. The story opens with a hijacking happening April 23, 2591 where a vibranium isotope is being stolen from North American Urban Centre #5. The robbery from the flying armoured tank is stopped by a hammer, wielded by Dargo Ktor, the Thor of this future Earth. I should point out that just before this, there is a 3 page origin of Dargo Ktor as the new Thor in this corporate owned future. 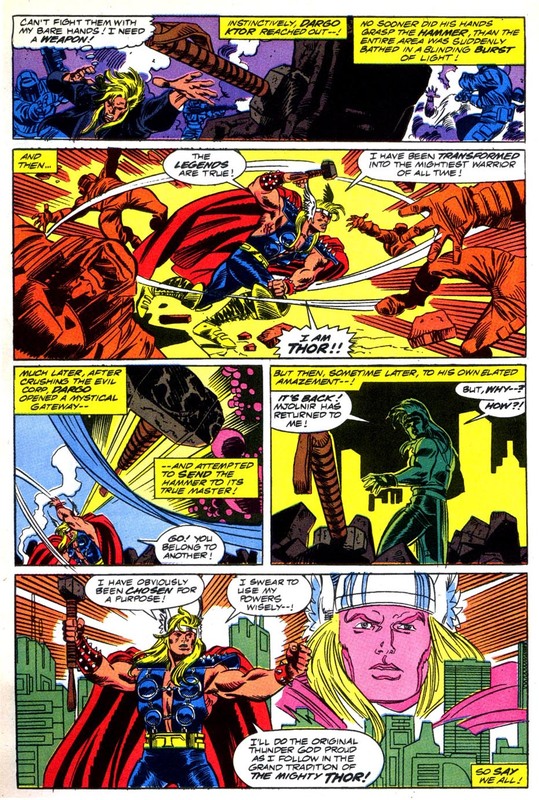 He wielded the hammer Mjolnir, it gave him the power of Thor as it does to those worthy and when the corporation that was in charge was overthrown, Dargo threw the hammer into the sky, but it came back, so he has carried on in the name of Thor. After stopping the robbery and handing the thieves over to the corporate police, Dargo returns to work, losing some money for lost time. Here we meet Varley a mid-level bureaucrat within the company, overseeing the mail and bemoaning all the staff who are not as hardworking as he, which based on his near-obsessive compulsive love of his work, is nearly everyone. The difference here is that he is an ancestor of Michael Korvac and the power of Korvac joins up with him. The Guardians of the Galaxy are traversing time in Drydock and are aware that the power of Korvac is due to appear in 2591 and arrive their looking for its latest host. They are too late and Varley enters the office of the company’s chief executive, and as a result, leader of the planet and declare that he’s taking over. 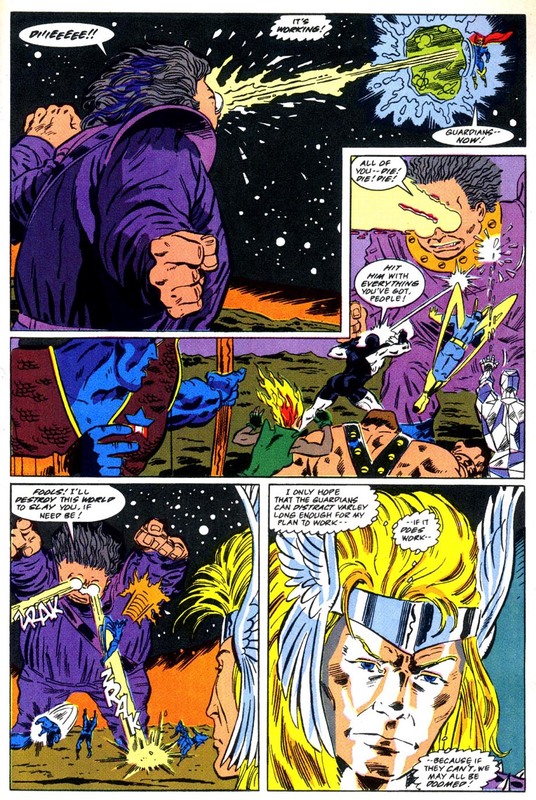 The Guardians arrive and there is a brief battle where Varley quickly takes care of the Guardians. 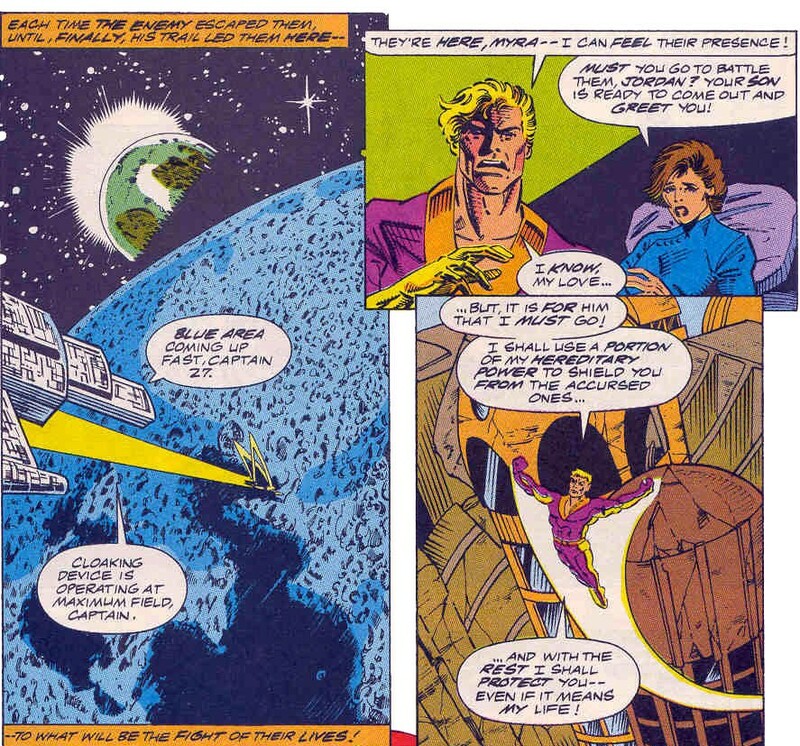 In the home of Dargo Ktor, he and his wife Salla see Varley’s pronouncement of leadership on a hologram beamed into the tri-vision, this era’s mass entertainment system. 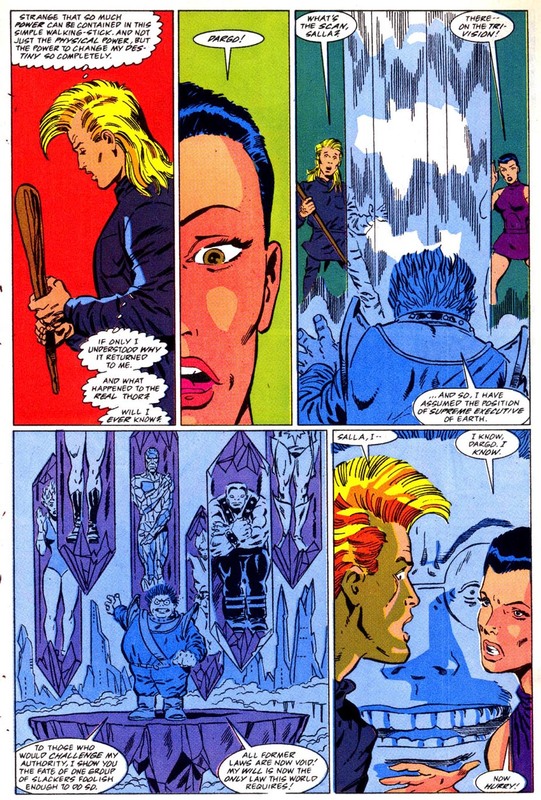 Seeing the Guardians and Varley, Dargo grabs the walking stick that the hammer changes to and leaves after a kiss from his wife. 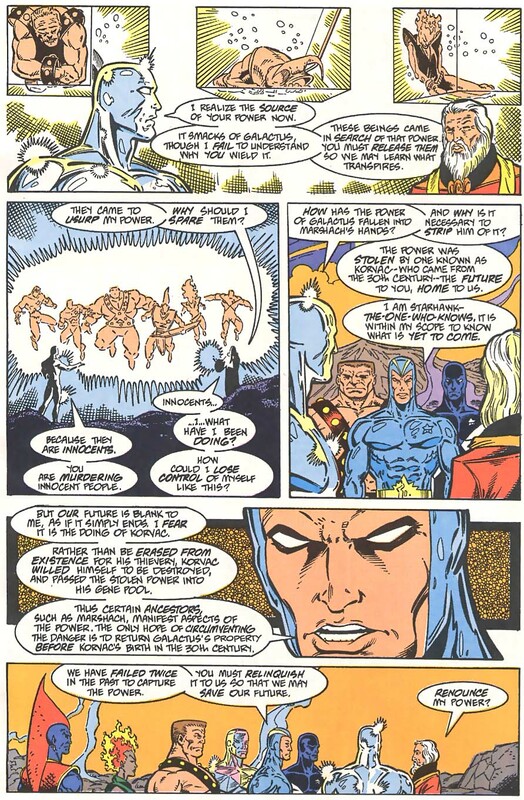 He arrives at the centre of the city and engages Varley, freeing the Guardians at the same time. The battle is joined, but the Guardians seem to be doing no better and withdraw. While licking their wounds Starhawk chides Charlie-27 for being defeatist after he mentions that they may have met their match. 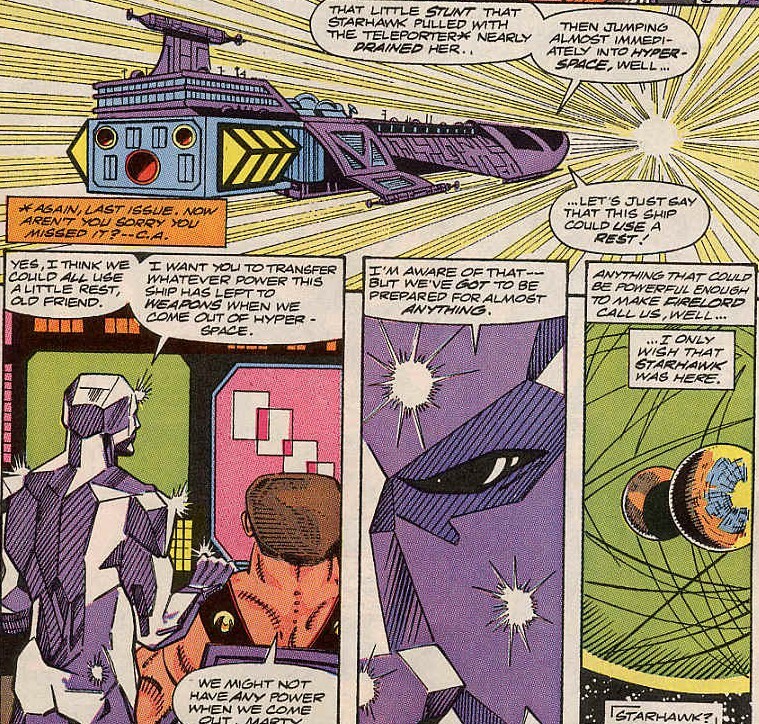 Starhawk points out that the Guardians have tracked this power through space, time and dimensional space. Dargo takes notice of that fact. Varley finds them, grows to massive size and holds them, the Guardians attack anew, giving Varley no time to react. 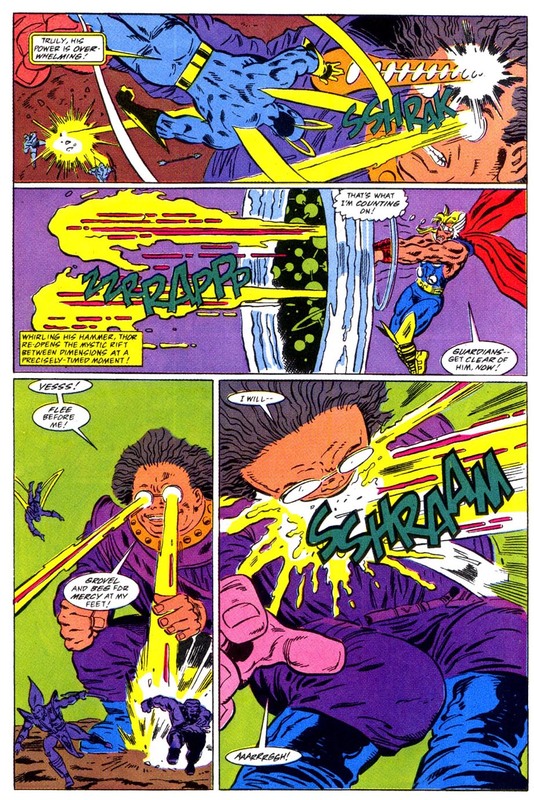 When he gets a second, Varley fires energy beams at Dargo, who uses Mjolnir to open a portal to send them back to their source. Varley is consumed by this power, which leaves local space. The Guardians have failed to stop this power and it now grows nearer to the time of Korvac’s birth. 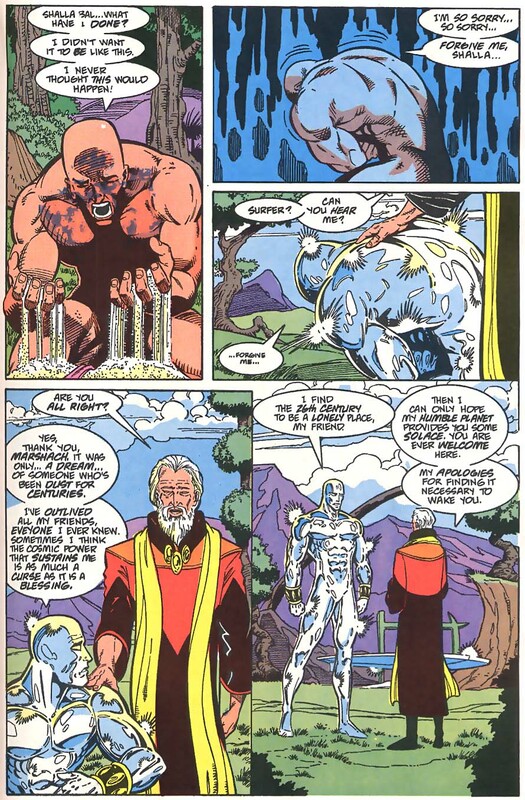 They decide to go on, Dargo offers to join them, but the Guardians point out that he is where he is needed, but are proud to consider him a friend. Notes: This was a better issue than the Fantastic Four part and feels like a better paced story. The idea of corporations running the planet and not governments feels more on the nose now that it ever has, not a great thought. 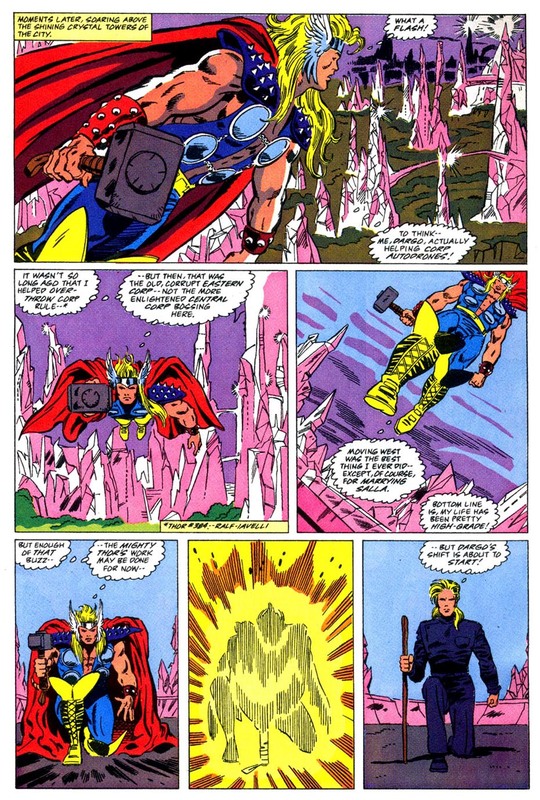 Dargo is a character that was introduced in Thor #384, introducing that future and another mortal to wield the power of Thor. Tom DeFalco’s plot is serviceable enough, I really did enjoy his run on Thor around this time as well as a decent Fantastic Four run and Kaminski’s script helps. I’m not usually a Herb Trimpe fan, but here his pencils work very well. 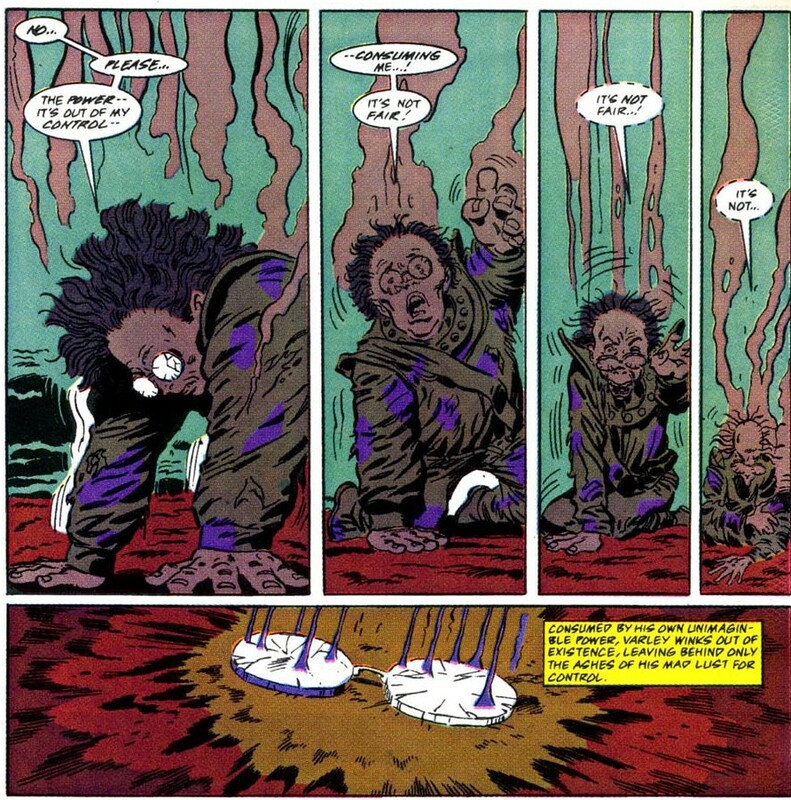 Varley is a forgettable one note villain and exists only to forward the plot, so it’s a weaker issue. But they are getting better, sadly not many notes. Fantastic Four Annual 24 was the 1991 annual and was on sale 11 November 1991 sharing the spinner racks with Angel & Ape #4, Captain America #386, Captain Atom #54, Damage Contol #1, Superman #56 and Uncanny X-Men #277. 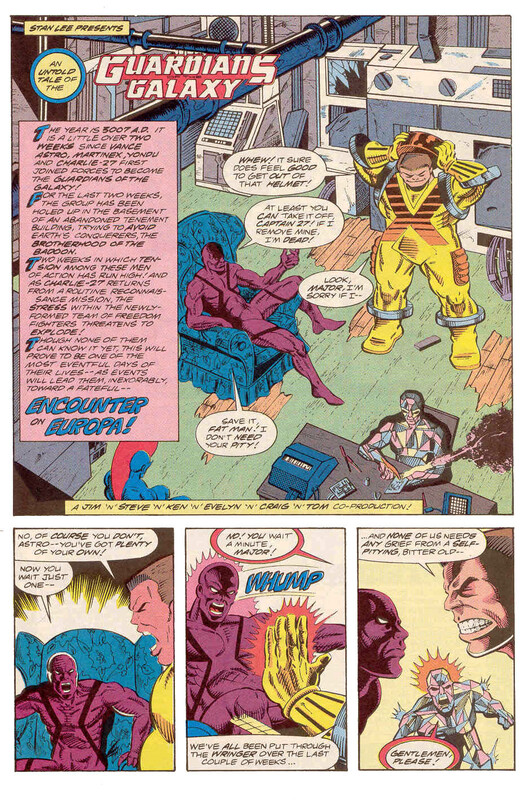 Future Tense was written and pencilled by Al Milgrom and opens with a brief history of Michael Korvac, recapping some of the Korvac Saga. 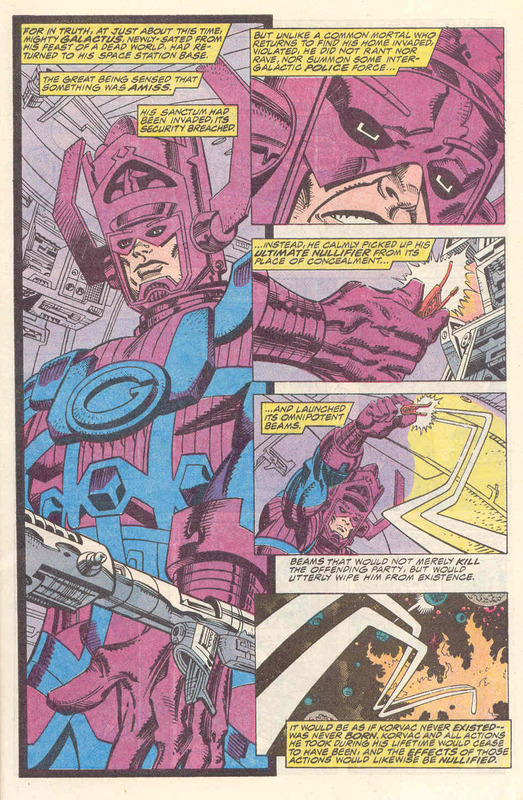 It focuses on what happened when Galactus, the devourer of worlds, noticed that Korvac had stolen some power from him and decided to use the ultimate nullifier on him, to end the threat of Michael Korvac forever. 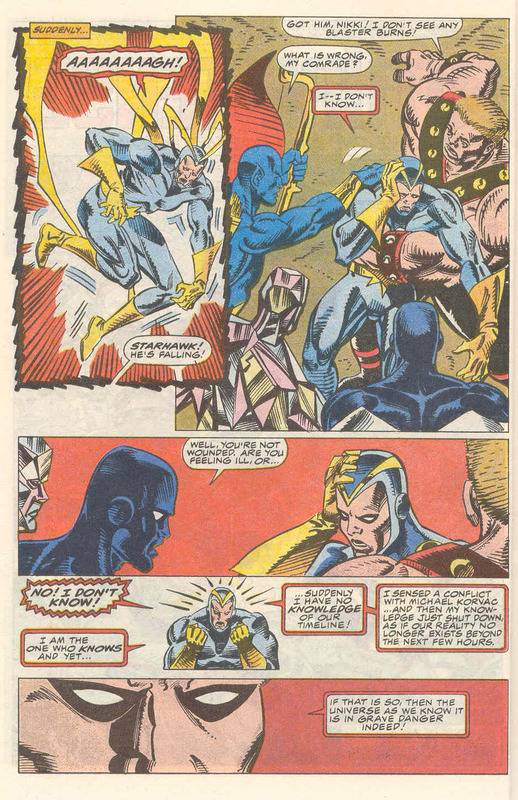 As this happens, Korvac is undergoing the final battle between him and the Avengers, (from Avengers 177) where Korvac dies by his own hand. Korvac, at the point of death sends his knowledge and power to an ancestor of his, so it will avoid being nullified and he can yet return. In the 31st Century the Guardians are deep in battle with the Badoon and Starhawk collapses, crying out that he no longer knows and that something is terribly wrong with their timeline and he catches a glimpse of Korvac. Immediately the Guardians head for the 20th Century to investigate and get themselves some help. 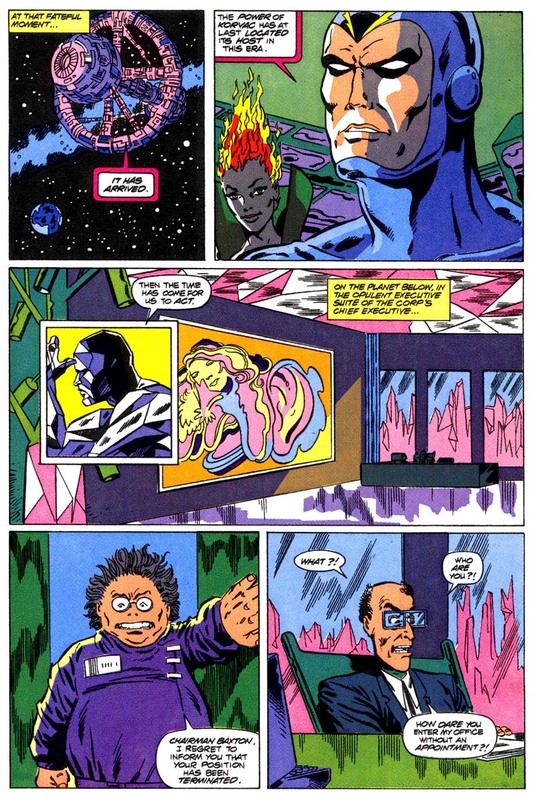 Knowing that they once prevented Galactus from consuming all there is in an alternate future timeline, Starhawk suggests the Fantastic Four as the allies needed in this time. Vance calculates the course and Drydock warps through time to the 20th Century. 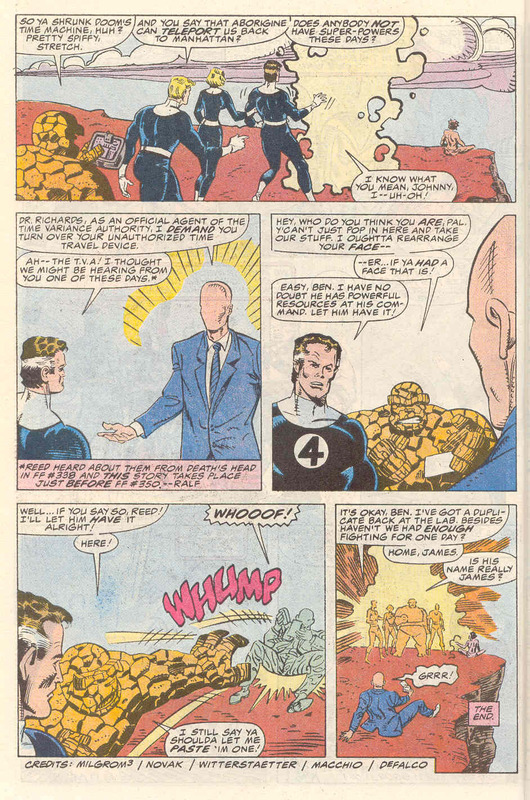 The team (less Vance, who still exists in this era) teleport down to Four Freedoms Plaza, the headquarters of the Fantastic Four and meet with Reed Richards who had detected their ship and was expecting their arrival. The two teams agree to work together and find Korvac’s energy signature in Australia. 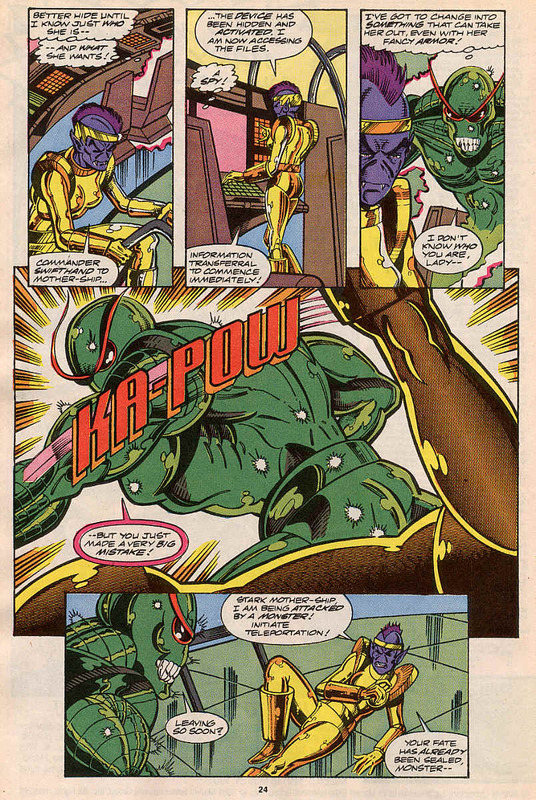 In order to allow Vance to join them and to locate this ancestor of Korvac’s Reed makes some new equipment up and calls in a colleague, Dr Henry Pym, formally the Avenger known as Ant Man/Giant Man/Goliath/Yellow Jacket (Delete as applicable) who using his patented pym particles shrinks the new tech down so it can be handheld and then it’s off down-under. They find the current host of the power of Korvac, a young woman who is wandering the outback and not much of a threat to anyone. 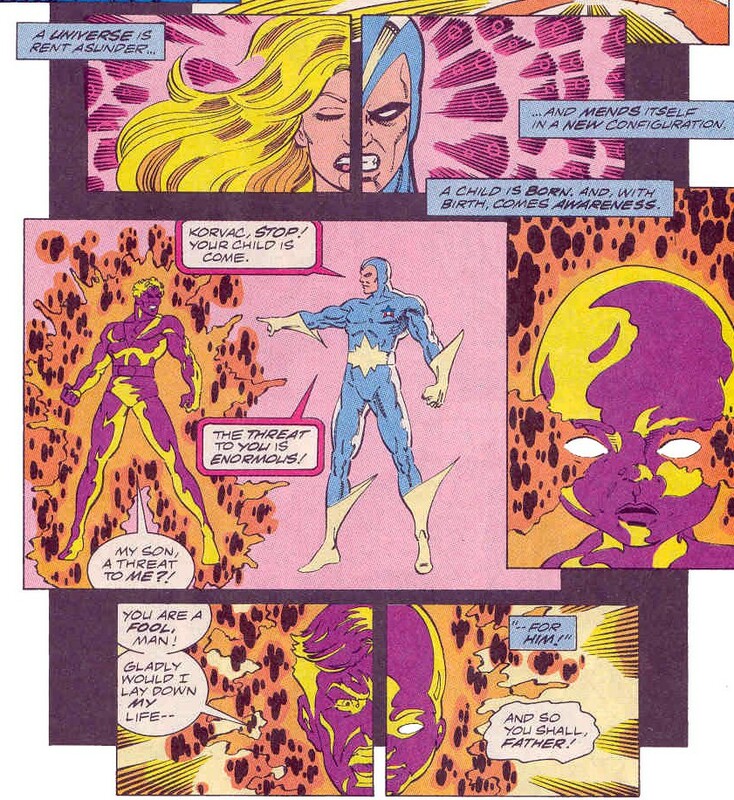 Then 9 super people charge her and her powers awaken, then Mr ‘Fantastic’ mentions Korvac and her/his memories awaken. This restored Korvac makes short work of the group, except for Mr Fantastic who pulls out Doom’s time platform, miniaturised by Dr Pym and travels back to the point that Galactus fired the nullifier and diverts it into the mini-time platform and then back to their battle in Australia. 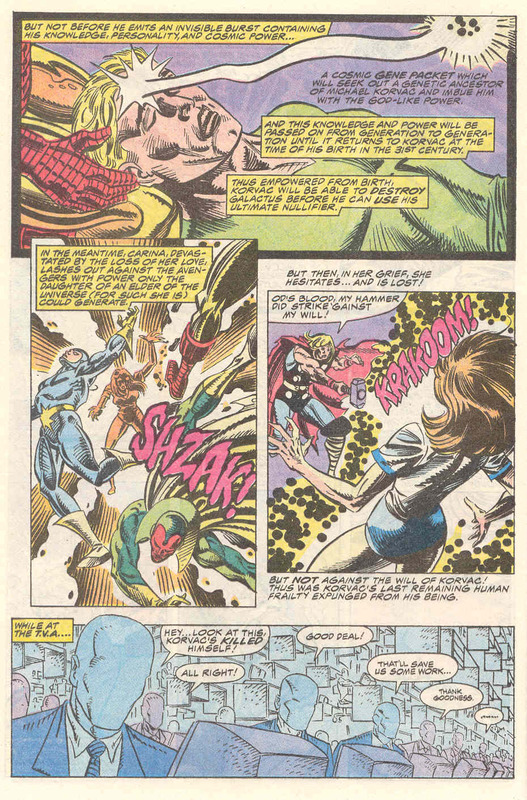 The beam is about to hit the girl, but Korvac’s essence flees into the future. With no Korvac to nullify, the beam ends and the woman goes back to her life after the Guardians of the Galaxy discuss the ethical dilemma of whether or not to kill her and prevent Korvac’s birth. 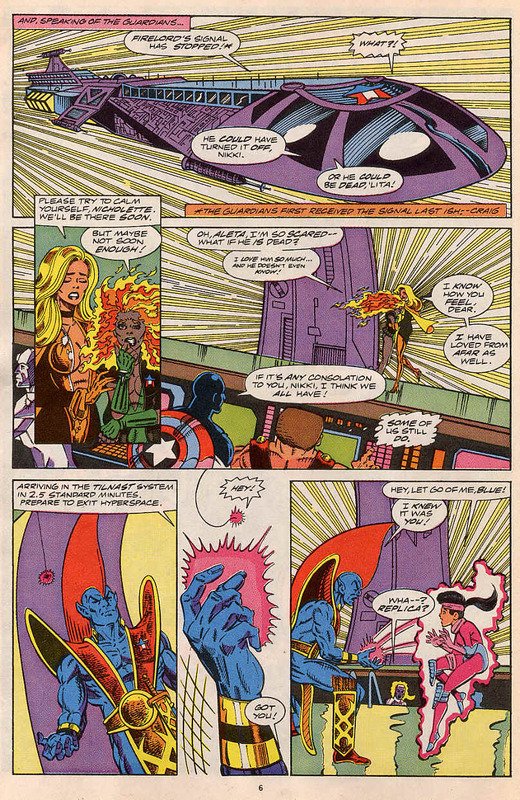 The Guardians are then teleported to their ship by the guest starring Gateway. At the end of the story a member of the Time Variance Authority, a sort of alternate timeline bureaucracy shows up to confiscate the mini-time platform, which Reed hands over since he has a copy back at home anyway. 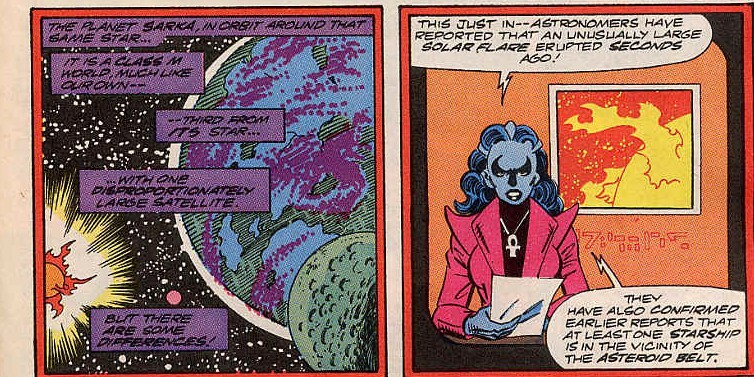 There are some none Guardians of the Galaxy back up stories, which as you can imagine, I’m going to ignore. Notes: Wow, was this a hard sit. 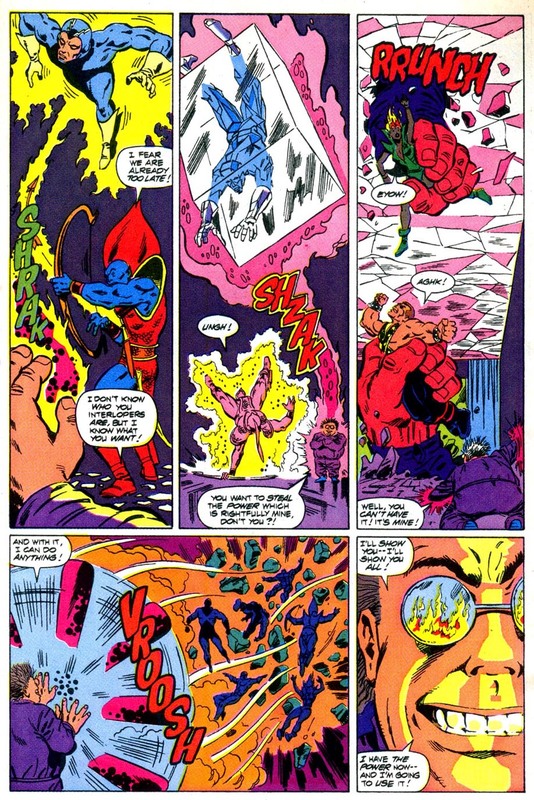 Wasn’t particularly a fan of the art or writing, which is a shame, because Al Milgrom has done stellar work in the past. This was part of Marvel’s four part annual series. 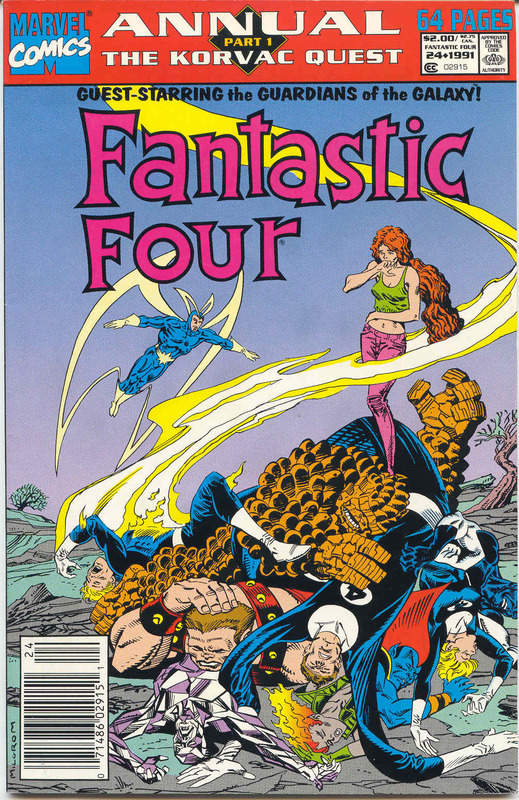 In 1991 and 1992, the Marvel contained stories which crossed over into four part stories. In this case Fantastic Four, Silver Surfer, Thor and Guardians of the Galaxy each had one part of the ‘Korvac Quest’ story. This to me makes lots of sense, a four part story allows you to take your time to tell and engaging story using a variety of characters and from a sales standpoint, it gets people to read titles they may not be looking at getting and might get them to read a new series, if it doesn’t you’ve at least sold 3 more annuals. This story also features an appearance by the Time Variance Authority, which acts as sort of time travel/alternate universe government department, enforcing the laws of continuity. All the mid-level guys are without faces, but the head looks like Mark Gruenwald. This is deliberate homage by the TVA’s previous writer Walt Simonson to Mark, who was one of marvels writers/editors and was often known as the keeper of Marvel’s continuity, no one could keep track of continuity like Gruenwald. 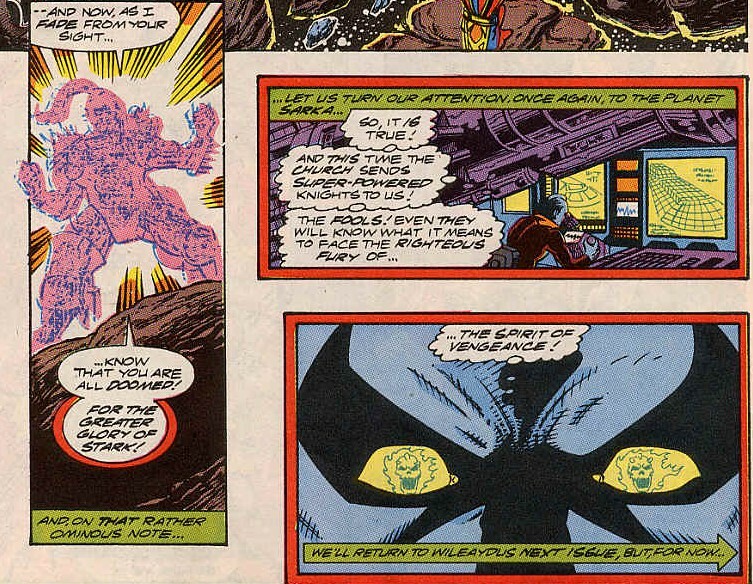 I’m not a fan of the idea that Korvac cheated death and sent his essence and memory to escape Galactus, which sort of takes away from the original Korvac saga. Guardians of the Galaxy 12 was cover dated May 1991 and was on sale in March 1991, sharing the spinner racks with Armageddon 2001 #1, Deadly Foes of Spider-Man #1, Emerald Dawn II #1, New Warriors #11, Twilight #1 and X-Factor #66. 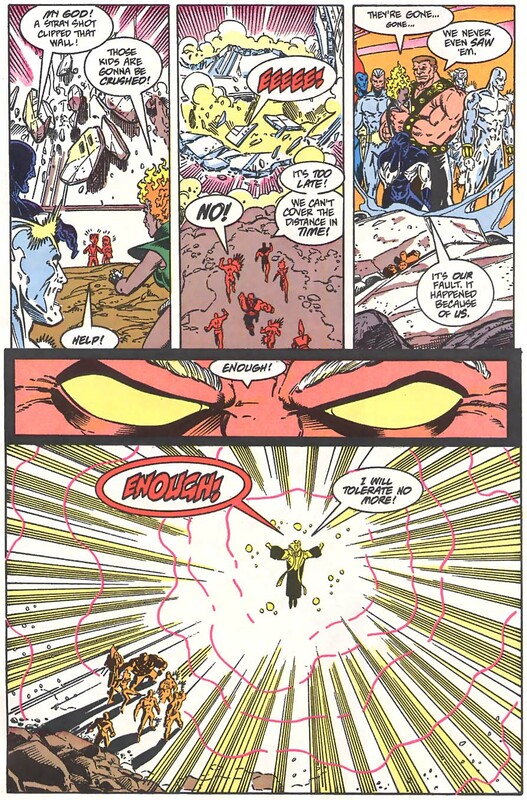 There’s nothing like a little Overkill was written and drawn by Jim Valentino and inked by Steve Montano and opens on Firelord in mid battle with an as yet un-named foe, who seems to be beating Firelord convincingly. 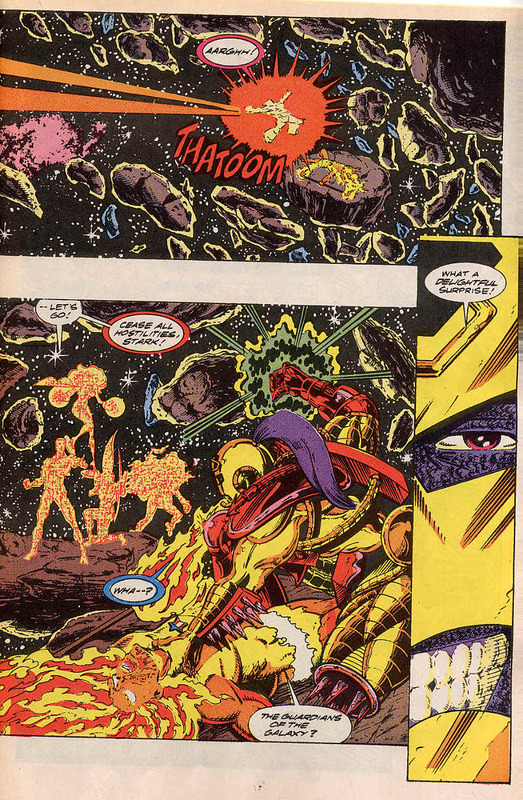 On the next page it’s clear to see that this a Stark in an unknown and war-like armour who boasts about getting his revenge, but Firelord has no idea who this Stark is, or how he is able to do so much damage to the former herald of Galactus. 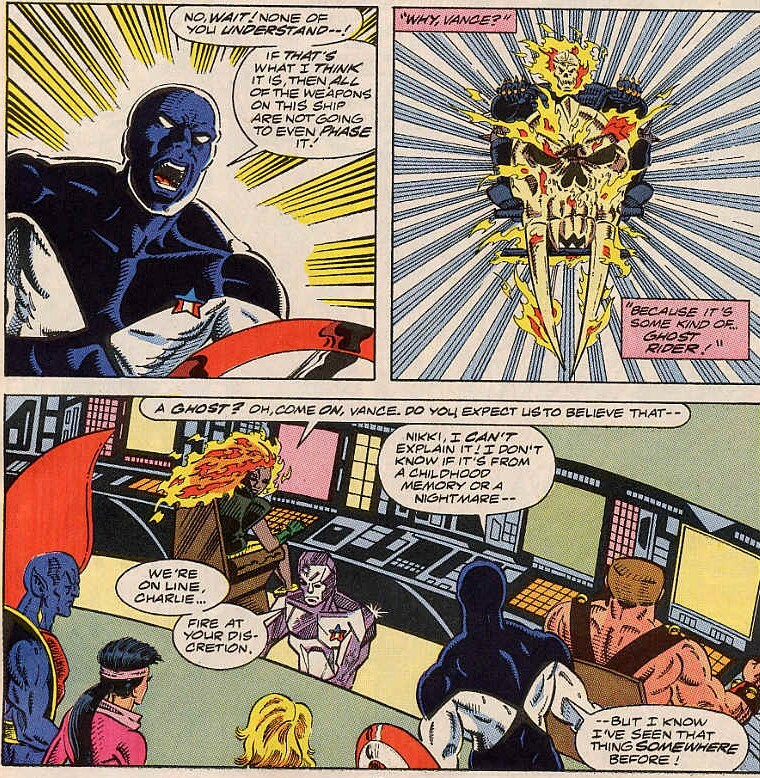 As Firelord starts to work out who his attacker is, the scene shifts to the Captain America II, on fast approach to Firelord’s location. On board Replica, the non-mutant shapeshifter from Haven appears after spending the gap between issues 11 and 12 as a flea on Yondu’s shoulder. She pleads to Martinex to let her on the team and before he can even think about it Nikki starts shouting about there being something wrong with Replica and storms off. Martinex as Replica to stay close to him for the time being and that her joining will be discussed later, while Charlie-27 points out how shaky the condition of the ship is. On Haven Starhawk places Giraud, now possessed by the Phoenix force into stasis and decides that even with the gaps in his memory related to coming events (See issue 7’s recap), he needs to be with his friends. The Guardians by this time have arrived in Tilnast and see Firelord and the as yet unnamed Stark in fierce combat. The Stark fleet, hidden within the system see their arrival and prepare to send over an espionage agent. 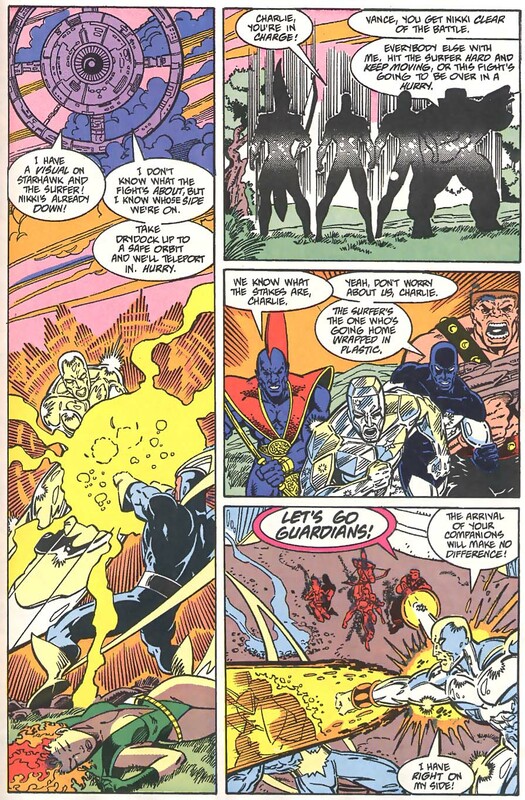 The Guardians’ ship fires on the Stark battling Firelord. The team leave Replica (a 13 year old girl) in charge of the guns, put on their transparent space suits and get outside. There is where we learn that this was Taserface (Still Funny) and has now been given the name of Overkill. He keeps all of the Guardians at bay, seeing them as no match. 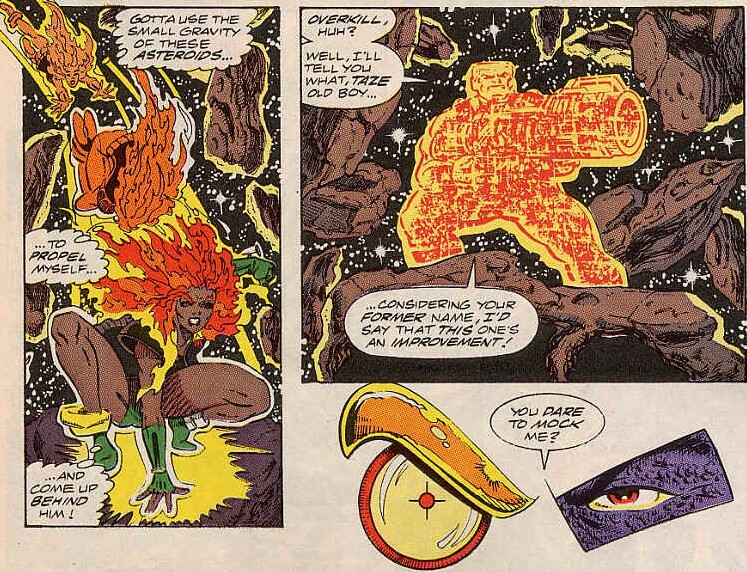 While all this is going on, Starhawk arrives and flies Firelord straight into the Tilnast’s system’s sun. The Scene changes to a planet in orbit of this star called Sarka, where the populace are told of solar-flare activity and a starship in the asteroid belt, before brining up that several of ‘Holy Knights’ have been killed by the flaming demon. One of the people in the street walks away determined to learn more. Back on the Captain America II, Replica see’s a Stark spy who has planeted a bomb somewhere on the ship and is now looking through the computer files, Replica changes into some kind of green monster and punches the Stark who claims victory and leaves. Back outside, Firelord has returned, fully charged from his visit to the sun and the whole team face off against Overkill. Overkill showing a great deal of restraint, decides to leave the Guardians to the Bomb and teleports away. On Sarka, the man on the street from earlier, remarks that the beings on the ship will soon face the Spirit of Vengeance, his eyes showing a flaming skull sign. On the Stark ship, Overkill revels in his victory and the Stark High Sister makes plans to use the Overkill armour as a prototype for an unstoppable new army. 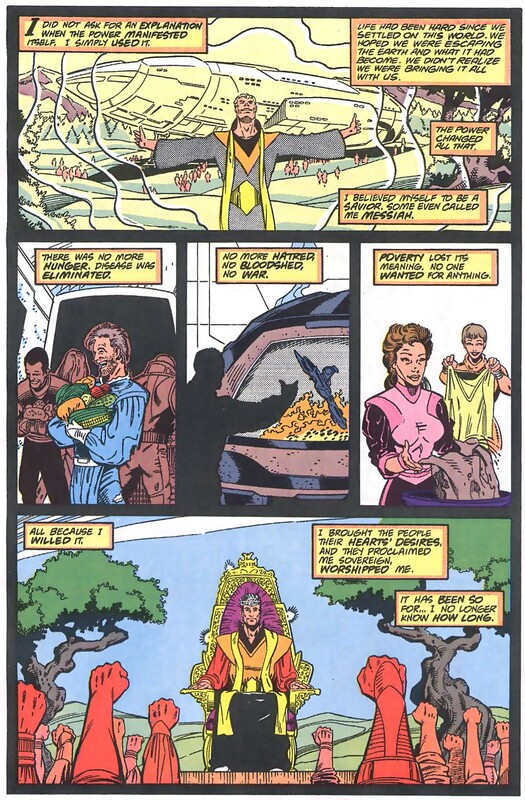 In space, Eon the cosmic entity and mentor to Firelord appears and calls him away to deal with another problem. He has enough time before he leaves to reject Nikki’s advances and flies off somewhere unknown. A heartbroken Nikki is then handed a flaming rose by Charlie-27 who passes it off as a gift from Firelord. 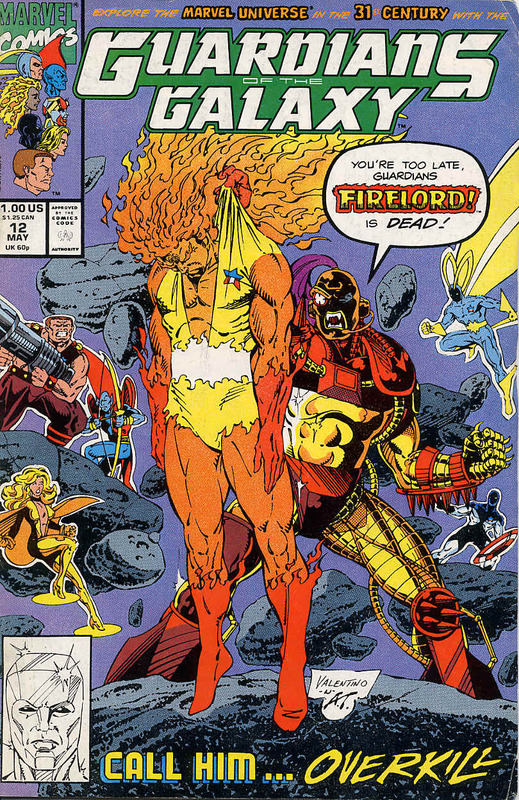 As the team seem to pose for a picture, Martinex realises that Firelord didn’t have time to get the flower and that Charlie did it to make Nikki smile without getting credit for it. Below the picture, the next issue box reveals Ghost Rider is coming. Notes: This is quite an action packed issue, bringing back the Stark and adding Replica to the cast, if not the team. The end of the last story seemed to be a lot of the Guardians of the Galaxy just watching stuff happen and it was nice to see them in action together again, however ineffectual. 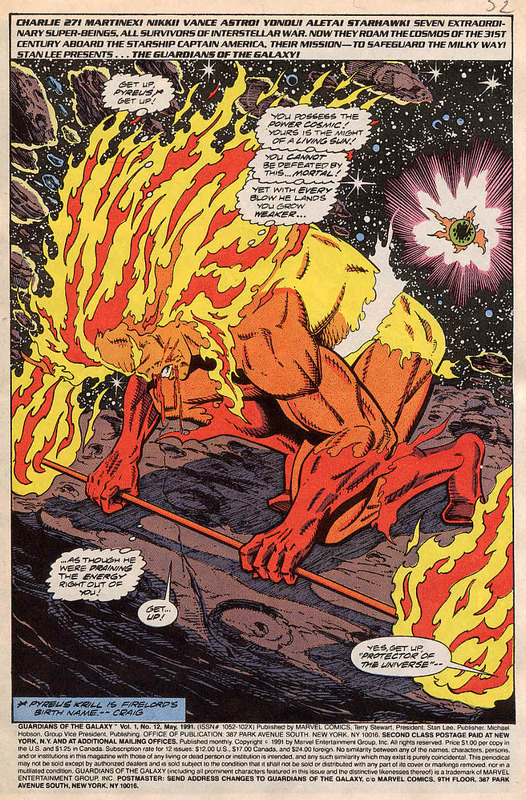 Firelord is at this point protector of the universe, a title held my Captain Mar-Vell and Quasar and was once a herald of Galactus. 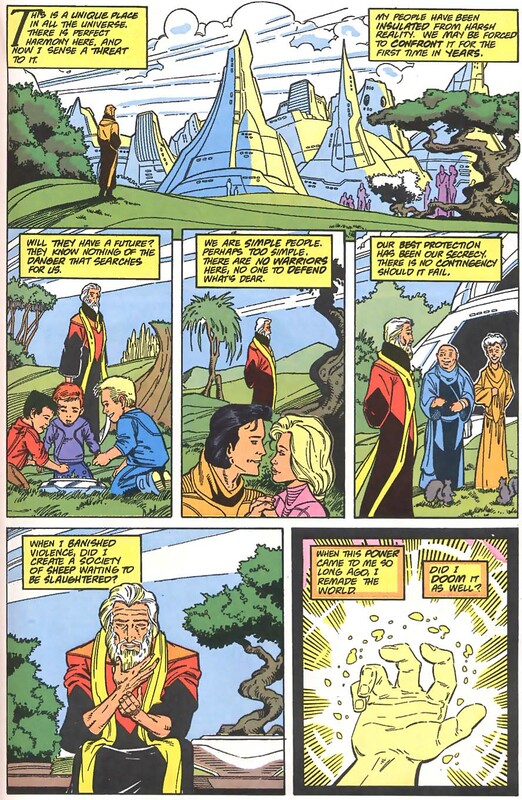 Once again, I have to note, the Guardians left the ship in the care of a TEENAGE GIRL to go save Firelord. When did that sound like a good idea? The Stark return at last, that subplot sort of went on for a while there didn’t it? 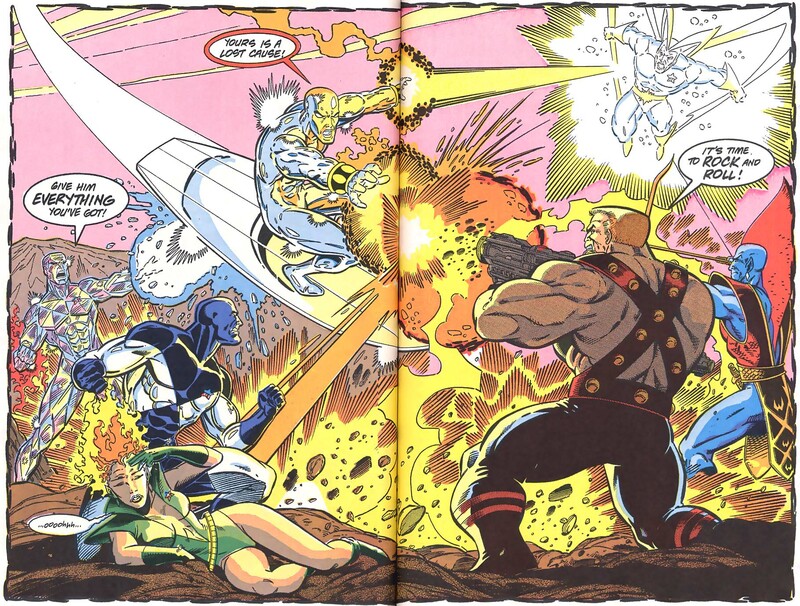 No more Taserface, I’ll miss that name, but Overkill does tend to be taken more seriously as a name, as well as a comment on the early 90’s in comics. 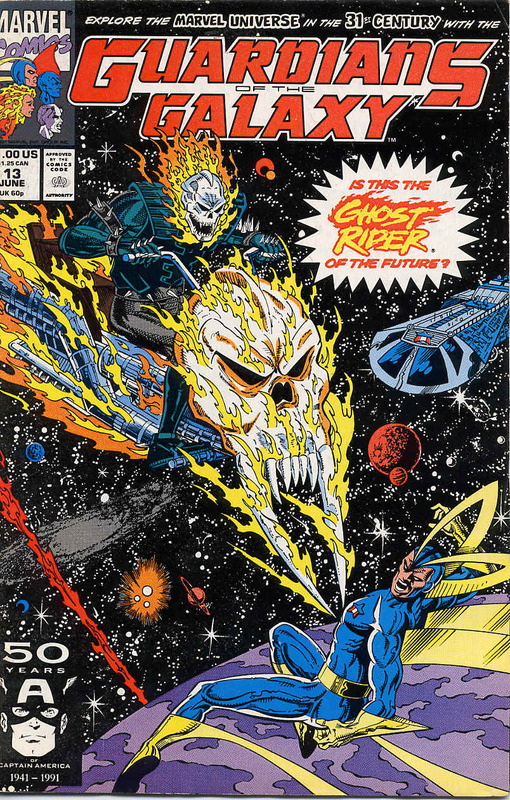 The church subplot starts to advance with more and more worlds being seen to be under this church’s influence and it’s hinted that there’ll be a Ghost Rider. Who if memory serves was doing very well at this point. This is the issue that I collected Guardians of the Galaxy from and I bought every issue until it’s untimely end at issue 62 and re-reading it again, found it still was as good as I remembered. Next time: Guardians of the Galaxy return to their guest star roots as we begin, the Korvac Quest.